Lloyd Wright was the eldest son of Frank Lloyd Wright and his first wife, Catherine Lee "Kitty" Tobin, and grew up in the 1889 Wright home and studio in Oak Park IL. Lloyd briefly attended the University of Wisconsin in Madison before leaving for a job at the Boston-based landscape architecture firm of the Olmsted Brothers. Specializing in botany and horticulture, he continued to pursue landscape design in addition to architecture throughout his life. He settled in Southern California around 1911. The Olmsteds sent him to assist with landscape design of the 1915 Panama-California Exposition in San Diego with architects Irving Gill, Bertram Goodhue, and Carleton Winslow. The exposition's principal buildings and gardens still remain in Balboa Park, and Gill became his mentor. 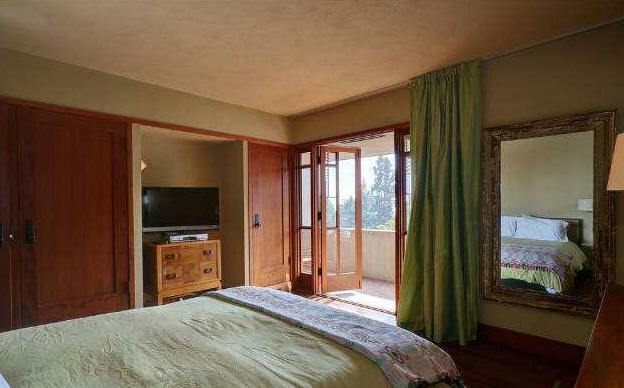 Beginning in 1919, Wright's famous father, working in Japan on the Imperial Hotel, delegated responsibilities for the Hollyhock House in Los Angeles to him and Rudolf Schindler. 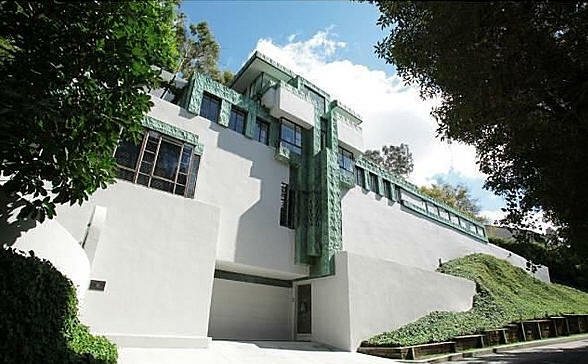 Lloyd Wright also worked on the Millard House, the Storer House, the Freeman House, and the Ennis house for his father. He also designed the second and third band shells at the Hollywood Bowl. The third shell stood until the end of the 2003 season. The largest collection of Lloyd Wright buildings in the United States was built between 1946 and 1957 for the Institute of Mentalphysics near Joshua Tree CA. Throughout his life, his work was constantly overshadowed and compared to his father's, which is unfortunate as Wright's work easily stands on its own. Had he been just a student of FLW, rather than his son, Wright's fame would have been significantly greater. 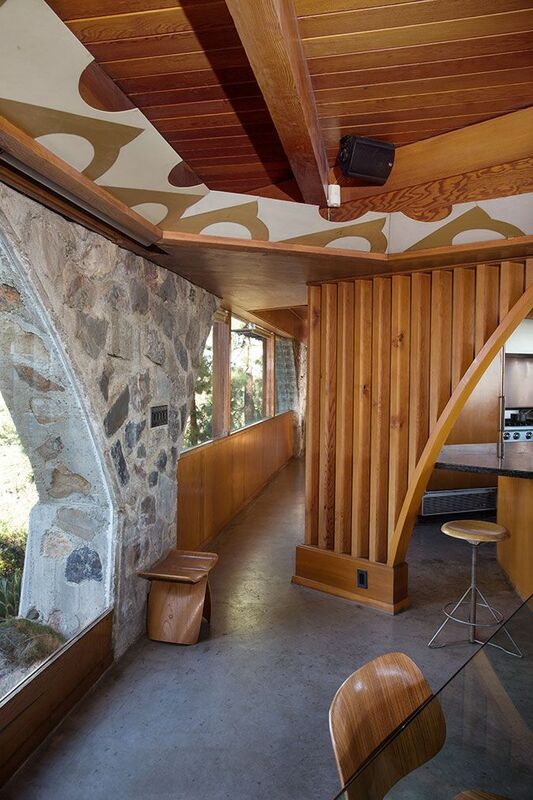 Wright designed many different styles of homes in addition to Modernist; they are included here as well. He was, much more than his father, well-patronized by Hollywood, which found him more approachable, less demanding, and less expensive. 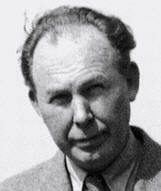 Architect Eric Lloyd Wright is the son of Lloyd Wright and his second wife, Helen. Many thanks to Catherine Westergaard Cramer for her research. 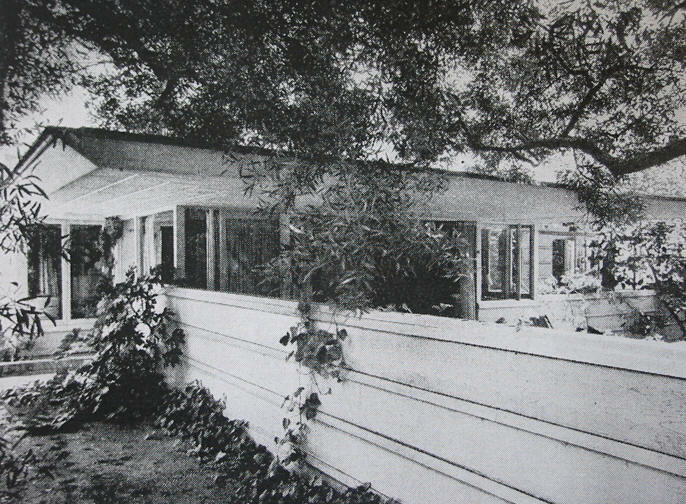 1920 - The Gregor Piatigorsky House, 400 South Bundy Avenue, Los Angeles CA. Sold in 2013 to the Murray and Maruja Lugash Trust. destroyed in 2014. 1921 - The William J. Weber House, 3923 West 9th Street, Los Angeles CA. 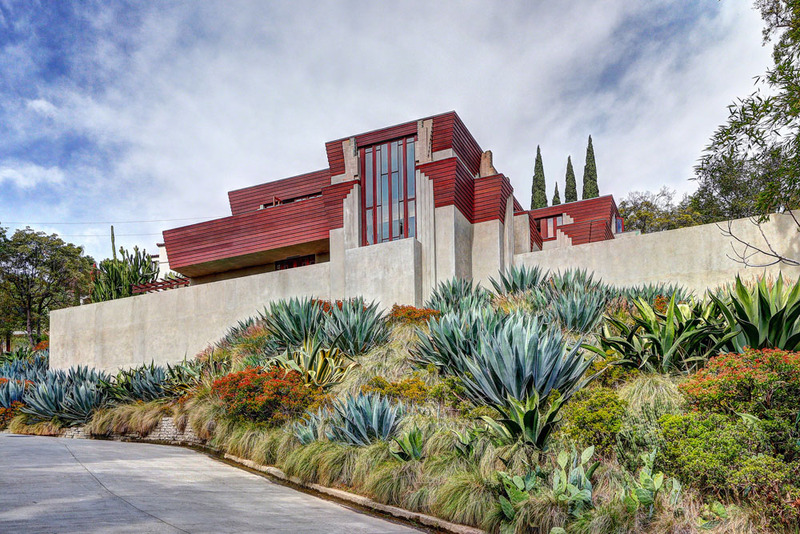 Wright's first completed project in Los Angeles and his first and last use of the Prairie style. 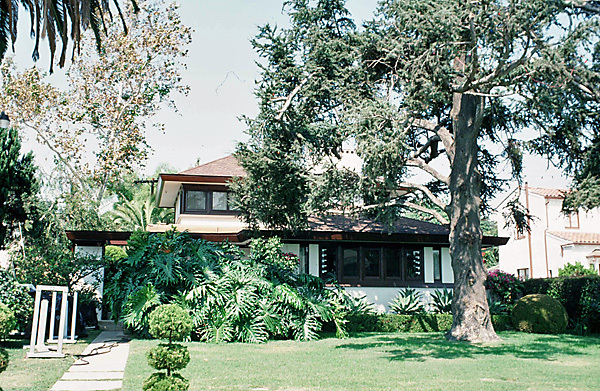 Weber originally hired Frank Lloyd Wright to design the house but he was too busy with work on other commissions, including the Imperial Hotel in Tokyo and the Hollyhock House. First photo from 1988 by Richard Kenyon. Sold around 1998 to Tom Price. Sold in 2002. Designated a Los Angeles Historic-Cultural Monument (707) in 2002. 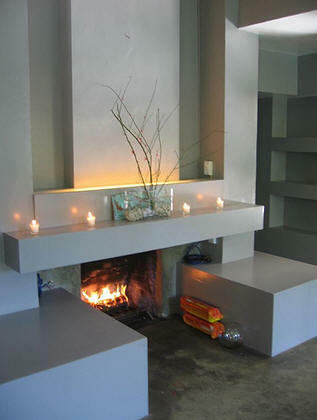 Extensively remodeled, bottom 2008 photo by Steven Rebello. 1922 - The Henry O. Bollman House, 1530 North Ogden Drive, Los Angeles CA. This was likely the earliest use of the textile block structural method used later by Wright's father. Sold in 1990 to Mimi London. Sold in 2014 to James Yunker and Suzanne Yousefzadeh. For sale in 2018. 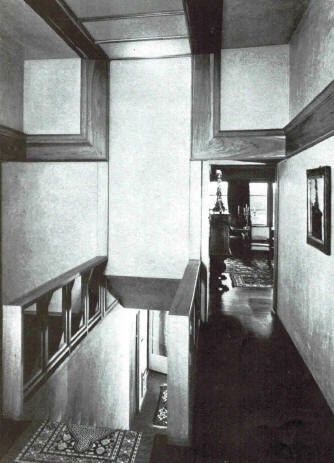 1923 - The Martha Taggart House, 2158 Live Oak Drive, Los Angeles CA. Commissioned 1922. 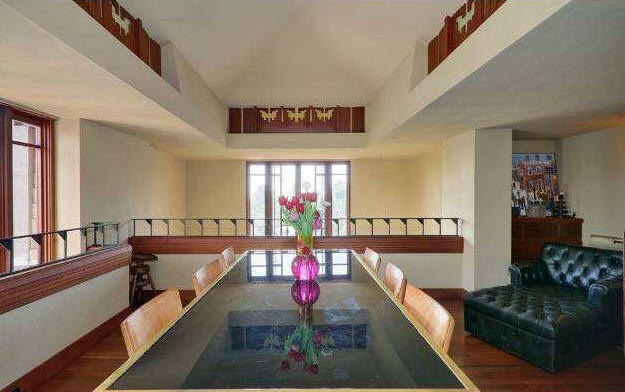 Designed for the mother of Lloyd Wright's second wife, actress Helen Taggart. 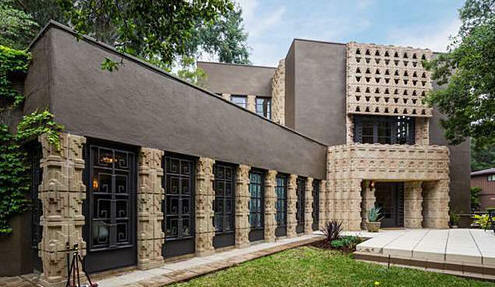 Lloyd Wright's son, Eric Lloyd Wright, completed an extensive remodel and won the 2006 Meliora Award for Best Restoration. Sold to Guy and Ashley Jacobs Shelmerdine. 1923 - The Otto Bollman House, 2200 Broadview Terrace, Los Angeles CA. Commissioned 1922. Built by his brother Henry Bollman. Altered 1978. Sold in 2008 to Thomas Muller and Carol Eliel. 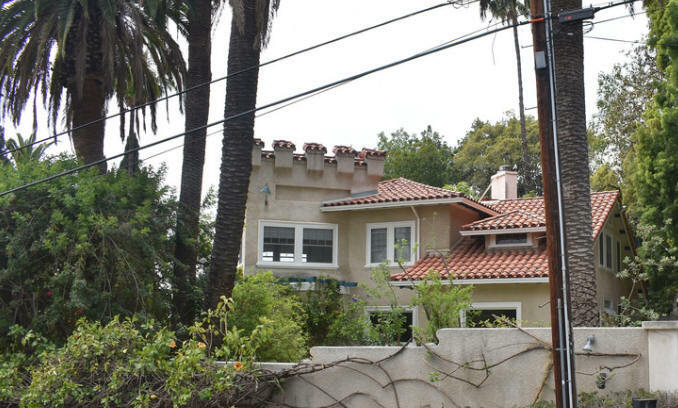 1925 - The Henry (aka Harry) and Alice Carr House, 3202 Lowry Road, Los Angeles CA. Originally it had a tent room on the side facing Rowena Street. Sold to Ronnie Burris. 1925 - The Herbert Howe House, 513 Roxbury Drive, Beverly Hills CA. 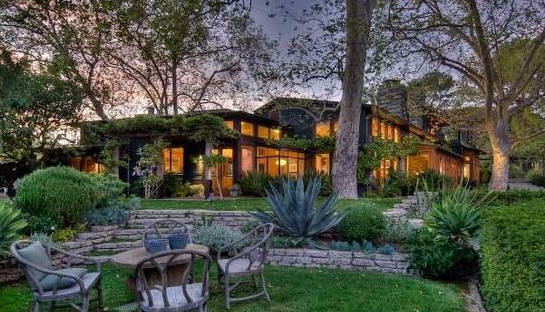 Sold in 1927 to actress Joan Crawford who lived there a year. Sold in 2001 to Brad Hunter. Deeded in 2004 to Adele and Gordon Binder. 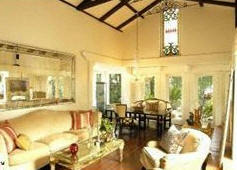 Sold in 2005 to the Raymond Janan Living Trust. 1925 - The John Stahl House, Beverly Hills CA. Unbuilt. 1926 - The Elizabeth Farrell House, 3209 Lowry Road, Los Angeles CA. Sold in 2011 to the Jeanne Cordova Trust. 1926 - The John (Jack) and Ruth Sowden House, 5121 Franklin Avenue, Los Angeles CA. Sold in 1945 to George Hodel. Sold to the Mazur family. 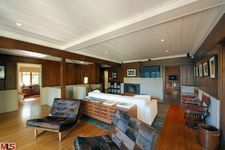 Sold in 2001 to Xorin Balbes who replaced the kitchen and bathrooms, remodeled the master suite, added a pool and spa. In 2003, Hodel's son Steve accused his father (who died in 1999) of committing the famous Black Dahlia murder there, among other killings. Sold in 2011 to Stephen Finkelstein. 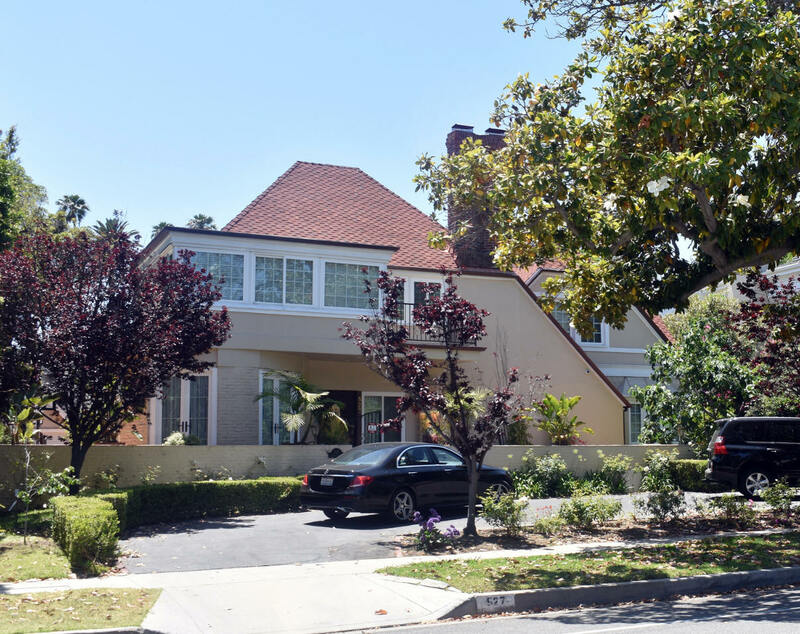 Sold in 2013 to Sowden House LLC, controlled by Finkelstein. 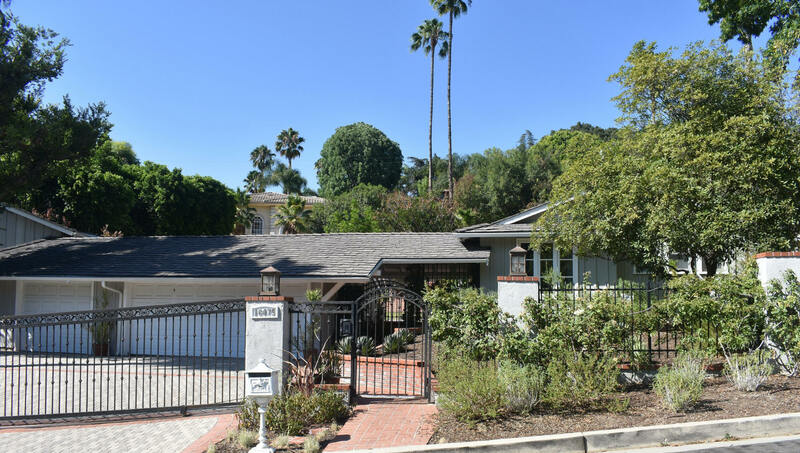 Sold in 2018 to Daniel Goldfarb aka MR Cedn, LLC. 1926 - The Calori House, 3021 East Chevy Chase Drive, Glendale CA. 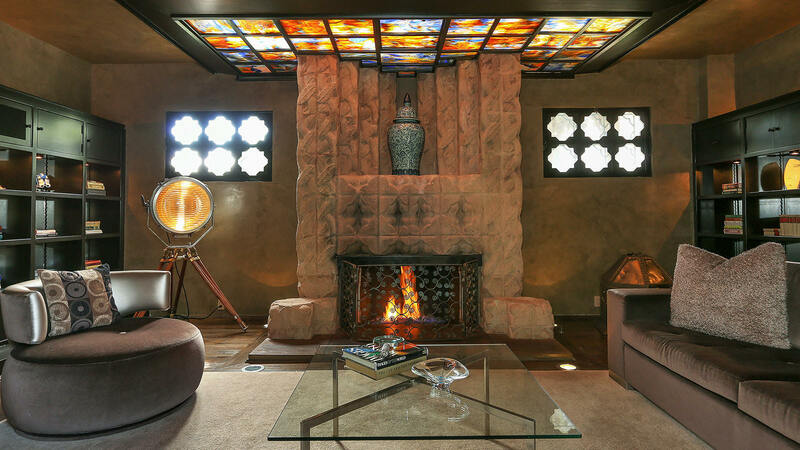 An interpretation of Spanish revival style. Sold in 1988 to John DeGomez then deeded to a family trust. Photos by Michael Locke. 1926 - The John Daniel Derby House, 611 Rexford Drive, Beverly Hills CA. Wright also designed the landscaping. Sold to Gail Winthrop in 2003. Top photo by Michael Locke. 1926 - The James Derby House, 2535 East Chevy Chase, Glendale CA. The Derbys separated prior to completion; only Mrs. Derby and the children lived there once built. Sold in 1974 to Michael and Carole Dougherty. Listed on the National Register of Historic Places. Sold in 2013. Sold in 2016 to Jeffrey Sanfilippo. 1926 - The E. R. Lewis House, 2948 Graceland Way, Glendale CA. A later addition marred the original design. Bottom photo by Michael Locke. Sold to Guerry C. Collins since at least 2007. Sold in 2015. 1926 - The J. G. Melson House, Los Angeles CA. Unbuilt. 1926 - The Elliot House, Glendale CA. Unbuilt. 1926 - The Lela Oliver House, Glendale CA. Unbuilt. 1927 - The Grover Jones House, Brentwood CA. Unbuilt. 1927 - The Burn Mountain Ranch House, Palm Springs CA. Unbuilt. 1927 - The Will Connell House, 335 North Berendo Street, Los Angeles CA. Connell was a photographer who shot most of Lloyd Wright's projects. Unbuilt. Apartments were built on the site around 1970. 1927 - The Harry Behn House, Kennington Drive, Chevy Chase Estates, Glendale CA. Unbuilt. 1927 - The Tent House, aka the Dune House, Palm Springs CA. Unbuilt. 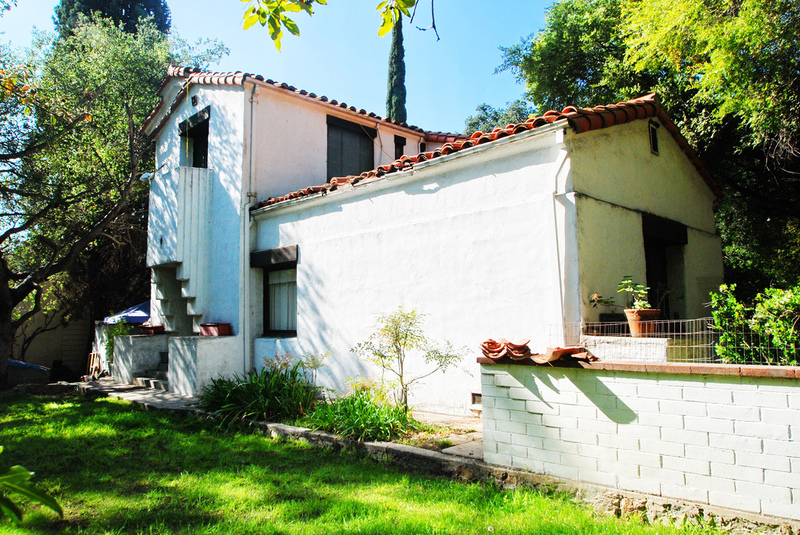 1927 - The William (Bill) Conselman House, 4905 Lockhaven Avenue, Eagle Rock CA. Around 1956, most of the house was destroyed to build a new one, preserving only the pool and one side of the house. Sold in 2014 to Jennifer Lindberg and Chris Cunningham. Photo from 2014. 1928 - The Louis Samuel House, aka the Samuel-Novarro House, 5609 Valley Oak Drive, aka 2255 Verde Oak Drive, Los Angeles CA. Both addresses represent the same location. Commissioned 1926. Designed for Ramon Novarro’s personal secretary and companion, Louis Samuel. However, when Novarro discovered Samuel was embezzling funds, he agreed not to press charges if Samuel turned over the house. Novarro rehired Wright to make the house his own, adding a pergola, music room and bedroom suite. Renters over the years included Leonard Bernstein, Jerome Robbins, Betty Comden, and Adolph Green, who rented the property while writing the Broadway musical On the Town. 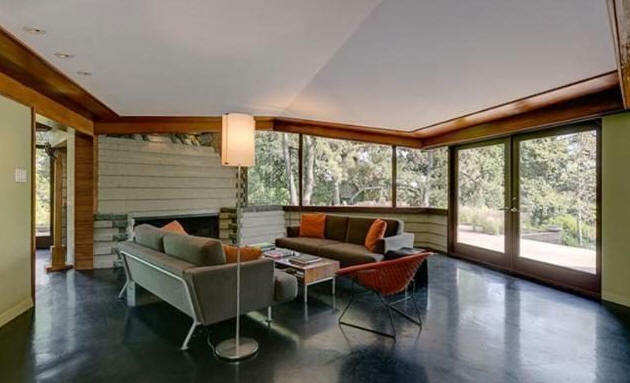 Sold to Moudary/Jowdy, who commissioned Wright in 1964 for a remodel that was unbuilt. 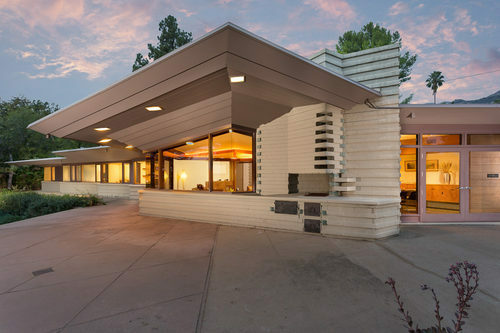 Sold to Charles Kasher, who commissioned Wright in 1973 for a remodel that was unbuilt. 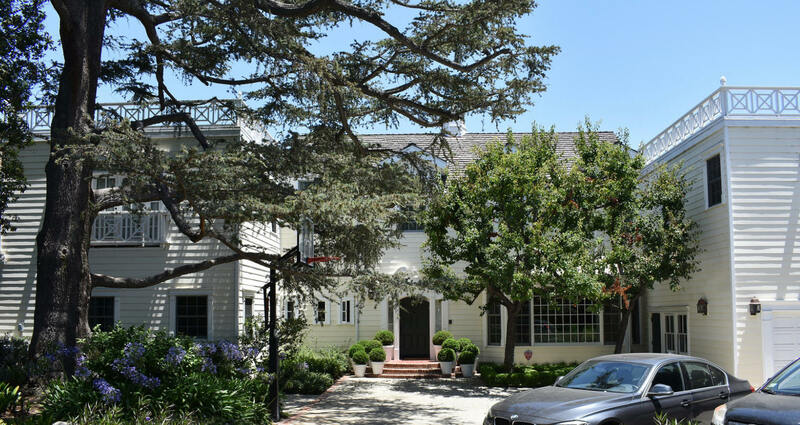 Sold in 1988 to actress Diane Hall, aka Diane Keaton. 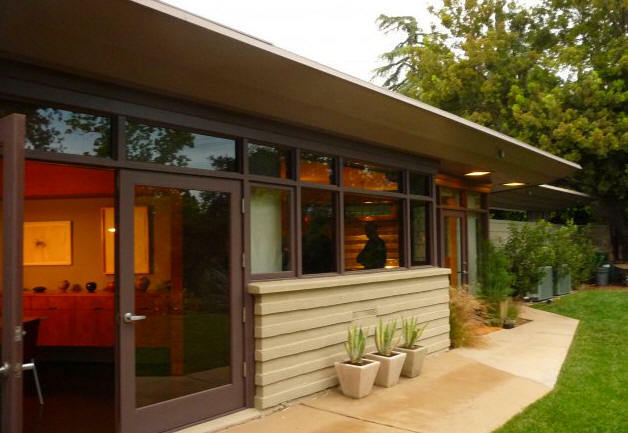 Extensively remodeled 1989-1992 architect by Josh Schweitzer. 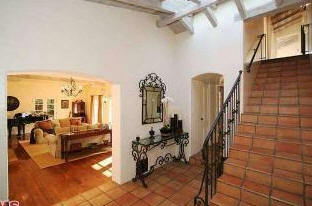 Sold in 2005 to actress Christina Ricci. Sold in 2006 to Apip 2005 LLC and Eric Deutsch. Sold in 2014 to Launer Properties LLC, aka Dale and Sol Launer. For sale 2016-2018. 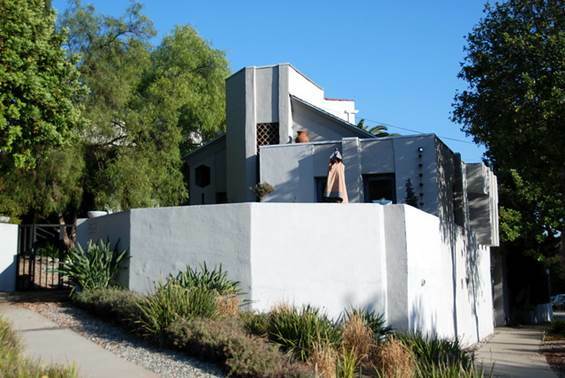 1928 - The Frank Lloyd Wright Jr. House and Studio, 858 North Doheny Drive, West Hollywood CA. 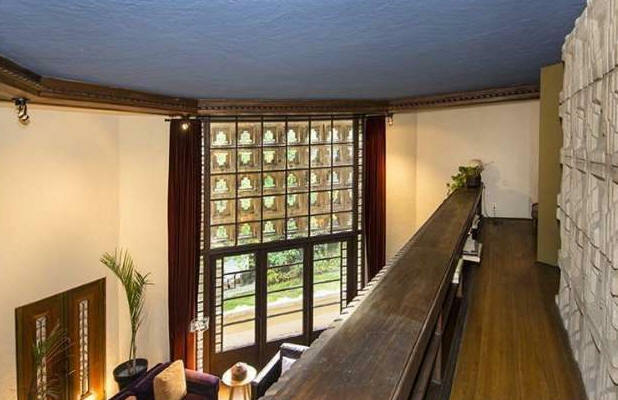 Deeded to his son, Eric Lloyd Wright, who did a restoration. Sold in 1989 to Peggi Hager. Sold to Brian and Judith Johnson. Sold in 2002 to Joseph Pytka Productions. Deeded in 2008 to Joseph Pytka. Sold in 2015. 1928 - The Milton Metzler House, Camarillo CA. Unbuilt. 1928 - The O. Meadows House, Laurel Canyon Park CA. Unbuilt. 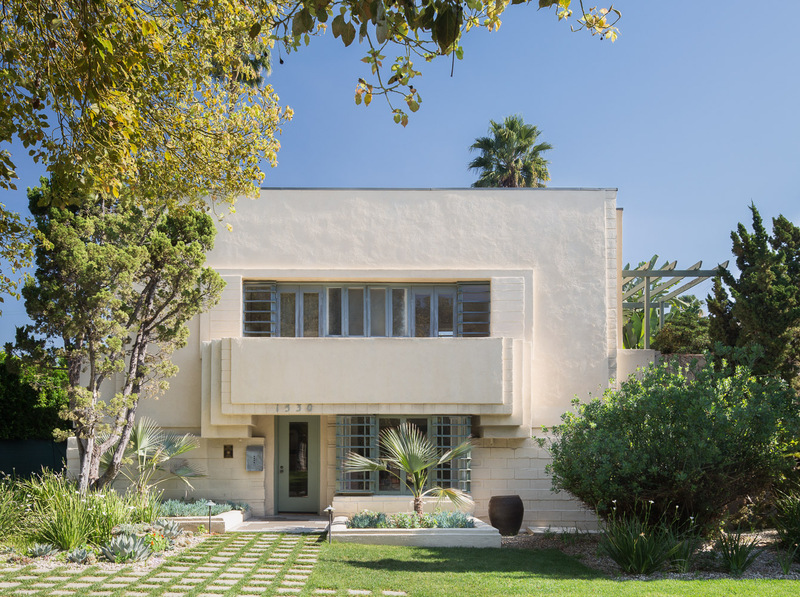 1930 - The Harold Swartz House, Los Angeles CA. Unbuilt. 1930 - The Richard W. Day House Renovation, 2049 Oakstone Way, Los Angeles CA. Located on several acres. Original house was built in 1916. Renovations were done in 1930, 1936, and 1941, according to Wright's archives. Sold in 1993 to Ronald Patterson. Sold in 2000 to Lloyd A. Levin. Sold in 2004 to Martin Stuart Henderson. 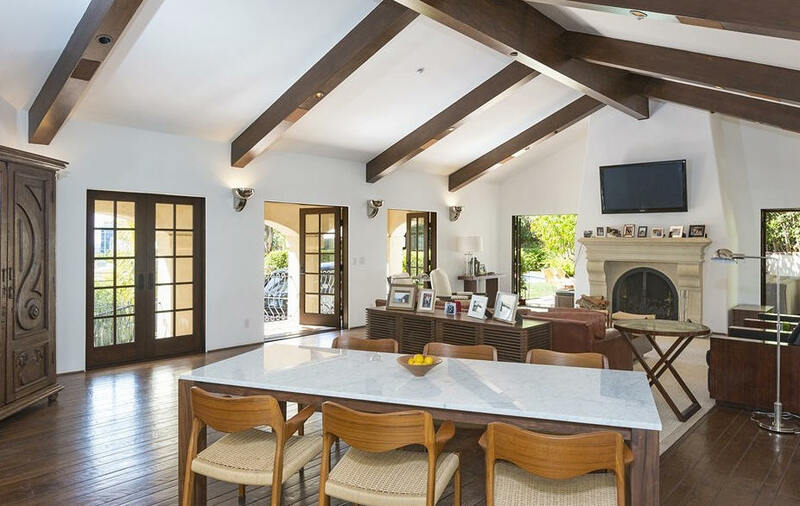 Sold in 2006 to actor Scott Caan. Deeded in 2014 to the 2049 Oakstone Trust, controlled by Caan. 1932 - The H. J. Halfhill Apartments, no location. Unbuilt. 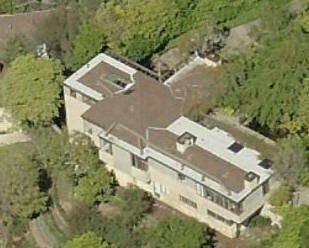 1932 - The Jules Furthman Addition, 10824 Chalon Road, Bel Air CA. 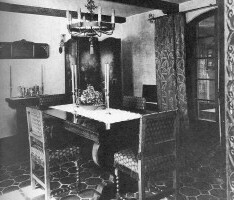 Original house was 1930. Unbuilt. Modifications were made by other architects much later. 1932 - The Burt Richardson House, 1849 Campus Road, Eagle Rock CA. Unbuilt. 1933 - The Phil Townsend Hanna House, St. Andrews Drive, Chevy Chase Estates, Glendale CA. 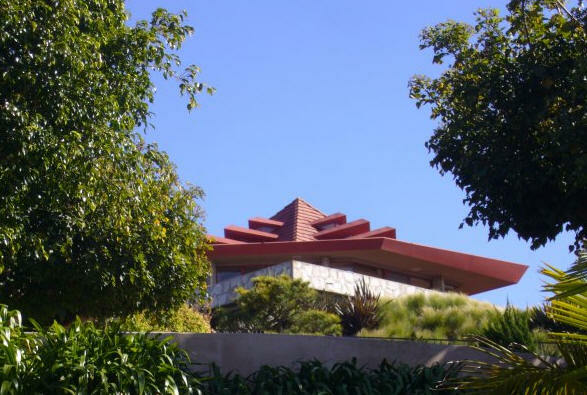 According to the LA Times, 6/7/1925: "....it is announced that three dwellings designed by Lloyd Wright will be erected in the next 30 days for Mrs. Florence E Hanna, Phil Townsend Hanna, and Daniel Derby." Unbuilt. 1933 - The Tule Mat House, Imperial Valley CA. Unbuilt. Later built by the Adams family in 1939, see below, with a different roof. 1933 - The Jobnya Howland Remodel, 502 Crescent Drive, Beverly Hills CA. She only lived there a few years before passing away quite young. The interior is supposed to be pretty wild. Sold to Eva Berger. 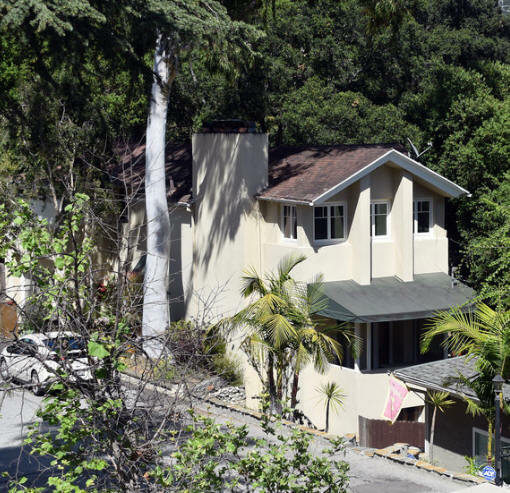 1933 - The Groucho and Ruth Marx House, 710 Hillcrest Road, Beverly Hills CA. 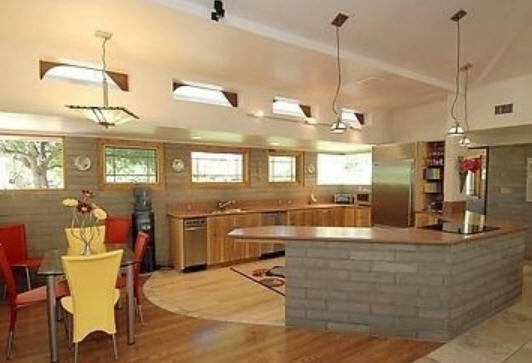 Sometimes cited as a Lloyd Wright design, but it is not. Around 1934 - The Mrs. Jesse M. Murphy Ranch Additions, 2800 Rustic Canyon Trail, Pacific Palisades CA. Original house was 1934. Deeded to The Huntington Hartford Foundation, for whom Wright planned unbuilt renovations in the 1950's with his father. 1934 - The Louis and Grace Samuel House, 579 North Bundy Drive, Los Angeles CA. Deeded to Grace Samuel. Sold in 2005 to Allison Nisonson and the Irene Weinrot Trust. Bottom photo by Michael Locke. 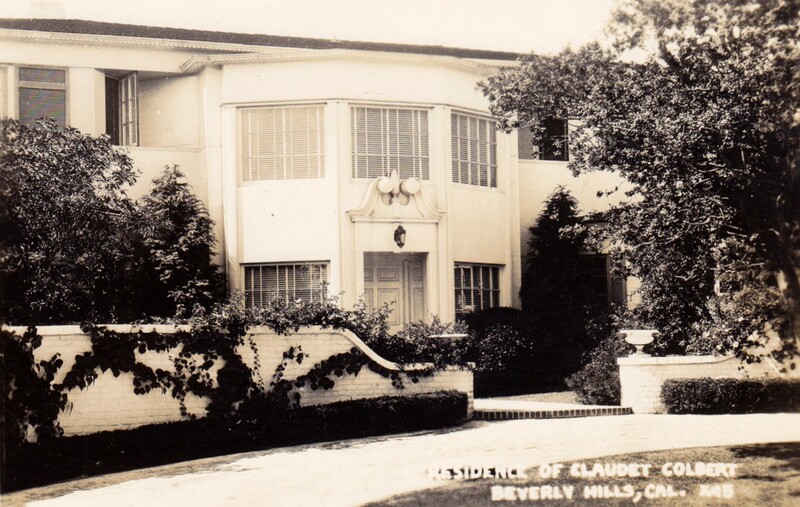 1935 - The Claudette Colbert House, 615 North Faring Road, Beverly Hills CA. She moved out in 1961. Sold to the Kresa Family Trust. Sold to Veracruz LLC. Sold to 615 North Faring Road LLC. Sold in 2014. Destroyed. 1935 - The Kenneth Niles House Remodel, 2601 Rutherford Drive, Los Angeles, CA. Unbuilt. 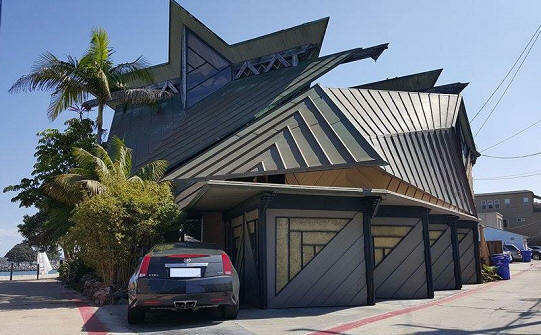 Sometimes cited as a Lloyd Wright design, but it is not. 1935 - The W. E. Sauer House Addition, 6309 McPherson Street, St. Louis MO. Unbuilt. 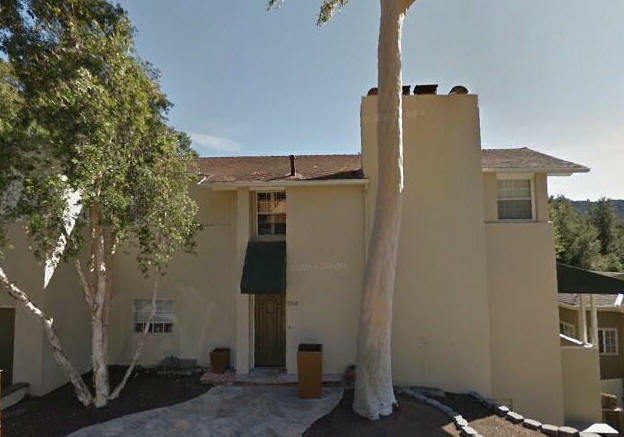 1935 - The Raymond Griffith House, 5230 Linwood Avenue, Laughlin Park CA. Unbuilt. Wright did a home for Griffith at another location in 1936. 1935 - The Charles Vidor House, Briarcrest and Alto Cedro Drive, Los Angeles CA. Unbuilt. 1936 - The Warwick Evans House, 12036 Benmore Terrace, Los Angeles CA. Sold to the Daniel and Hilary McLoughin Trust. Wright also did some later modifications. Sold in 2016 to the George and Mary Garvey Living Trust. 1936 - The Raymond and Bertha Griffith Ranch House, 4900 Dunman Avenue, formerly 4965 Rigoletto Street, Woodland Hills CA. In a time when most people did not have any air conditioning, the Griffith house had three air-conditioners and three climate zones. Featured in June 1938 Architectural Forum. Wright also designed the Yucca-Vine grocery store for the Griffiths, since destroyed. 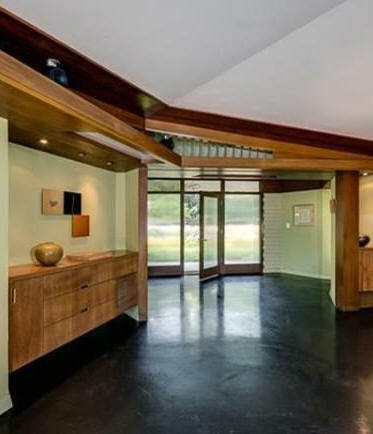 Remodeled in 1951 for L. N. Schwein, who wanted to build a private airplane landing field on his 35 acre tract. Schwein's request was denied. Top photo by Michael Locke. 1937 - The Charles Butterworth House, 400 Parkwood, Los Angeles CA. Unbuilt, according to Weintraub. 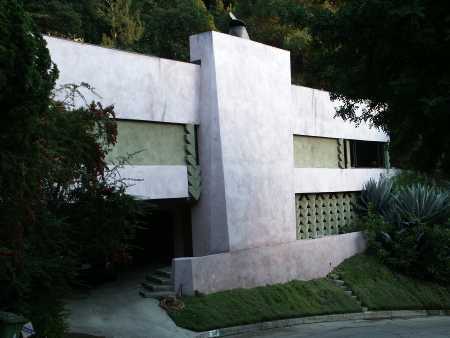 1937 - The Otto and Pern Brower House, 523 Chapala Street, Pacific Palisades CA. Renovated in 1942. 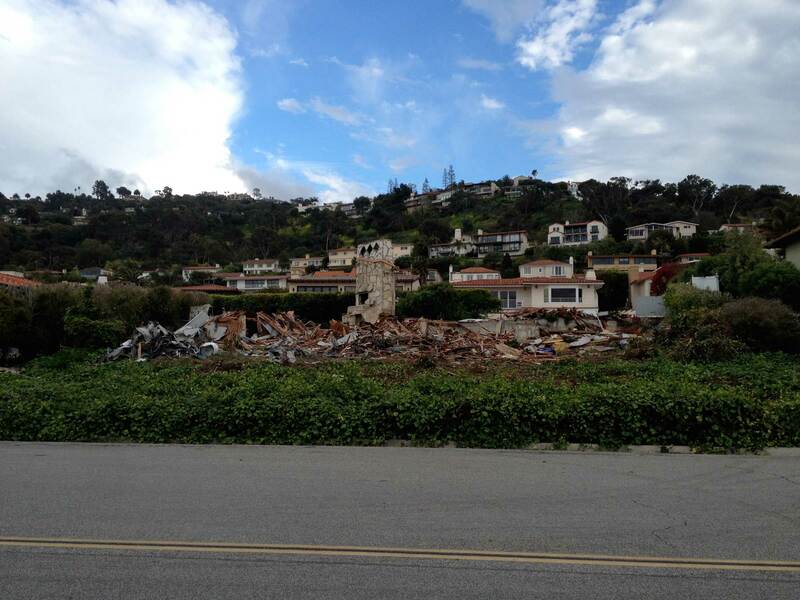 Original house appears to have been destroyed or dramatically remodeled. Sold in 2014 to Thomas Barry. Needs verification. 1937 - The S. M. Lazarus House, 4966 Ambrose Avenue, Los Angeles CA. Unbuilt. The client went with a different architect. 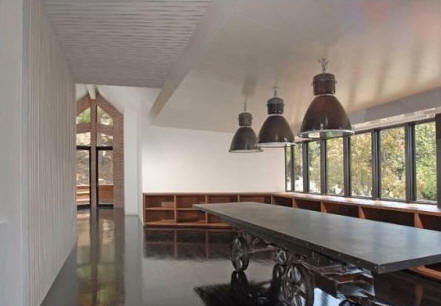 Around 1937 - The Roger Edens House Remodel, 304 South Cliffwood Avenue, Los Angeles CA. Roger Edens was a key player in the creation of classic MGM musicals like Singin' in the Rain, An American in Paris, Meet Me in St. Louis, and Easter Parade. Sold in 2002 to William and Cecelia Feiler. Photo by Michael Locke. 1937 - The Harry Ruby Addition, 805 North Rodeo Road, Beverly Hills CA. Unbuilt. 1937 - The Felix Jones House, Valley Street, Burbank CA. Unbuilt. 1937 - The David C. and Alice D. Gracy House, 2509 Harris Boulevard, Austin TX. Unbuilt. 1938 - The Francis Blalock House, Los Angeles CA. Unbuilt. 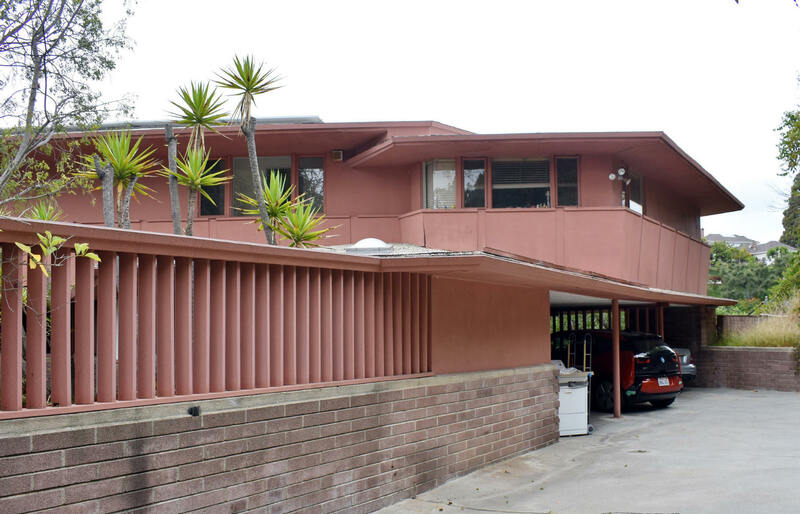 Wright also designed an apartment building for her in Alhambra CA in 1949, also unbuilt. 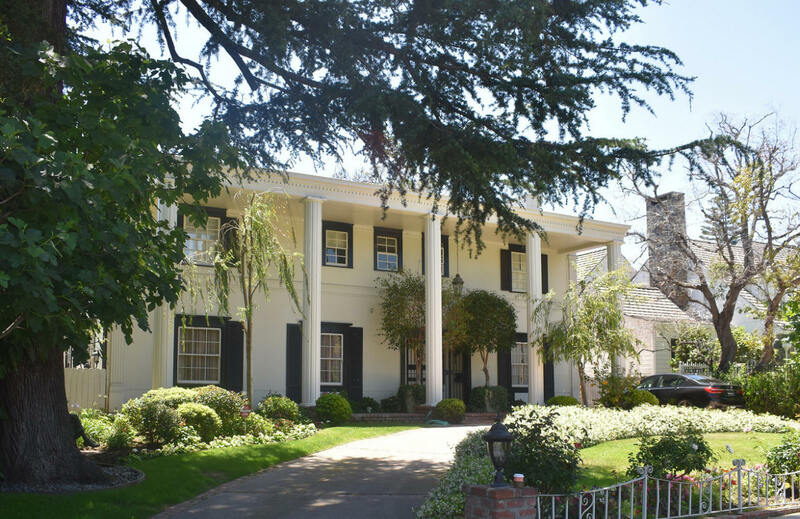 1937 - The Stephen Avery House, 365 North Rockingham Avenue, Brentwood CA. Sold in 2000 to David Johnson. 1938 - The H. H. von Benthuysen Remodel, 937 South Masselin Avenue, Los Angeles CA. Unbuilt. 1939 - The William A. Smith House, Los Angeles CA. Unbuilt. 1939 - The Four-Square Unit Housing, Los Angeles CA. Unbuilt. 1939 - The Adams Residence, aka the Mat House Design, 7400 Tampa Avenue, Reseda CA. Deeded to their son. Deeded to their son's wife, Barbara, who lived there until around 2009. Sold to Hector and Galesi Semidey. 1939 - The Jascha Heifetz House, 18 Harbor Island, Newport Beach CA. Sold to Harold Amundsen. House has been destroyed, date unknown. Sold at auction in 2010 to Telluride Trust. Sold in 2013 to East West Bk Bfc. House above is new. 1939 - The George and Justine Haight Remodel, 613 North Beverly Drive, Beverly Hills CA. Original house was built in 1911. Photo by Michael Locke. 1940 - The Jascha Heifetz Studio, 1520 Gilcrest Drive, Los Angeles CA. The studio was reconstructed as part of the Colburn School in downtown Los Angeles. 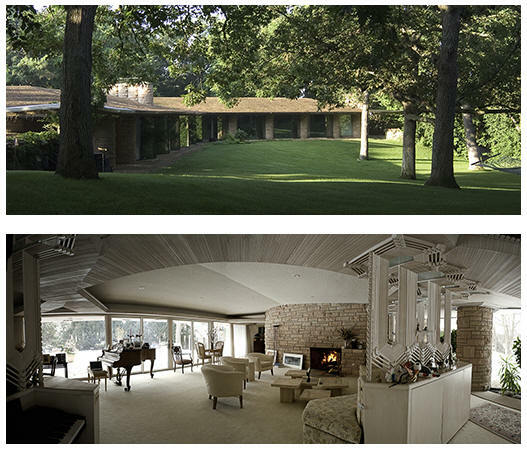 The site became a new house for actor James Woods in 1996, designed by Lisa Claiborne Matthews (bottom photo). 1940 - The Howard Greer House, 9200 Haskell Avenue, North Hills CA. Merged into the adjacent Valley Presbyterian Church building, built in 1970. 1940 - The Harold Swann House, Hope Ranch, Santa Barbara CA. Unbuilt. Harwell Hamilton Harris designed a house for them in 1938, also unbuilt. 1940 - The Armin Degener House, 3374 Deronda Drive, Los Angeles CA. Unbuilt. 1940 - The Grace Tibbett Remodel, 5250 Louis Avenue, Encino CA. Unbuilt. 1941 - The Grace Tibbett House, Bakersfield CA. Unbuilt. 1941 - The Harold E. Kaye Remodel #1, Comstock Avenue, Los Angeles CA. Unbuilt. 1941 - The Ramona Gardens Housing Project, 2830 Lancaster Avenue, Los Angeles CA. Commissioned 1940. Wright was one of about eight architects involved. 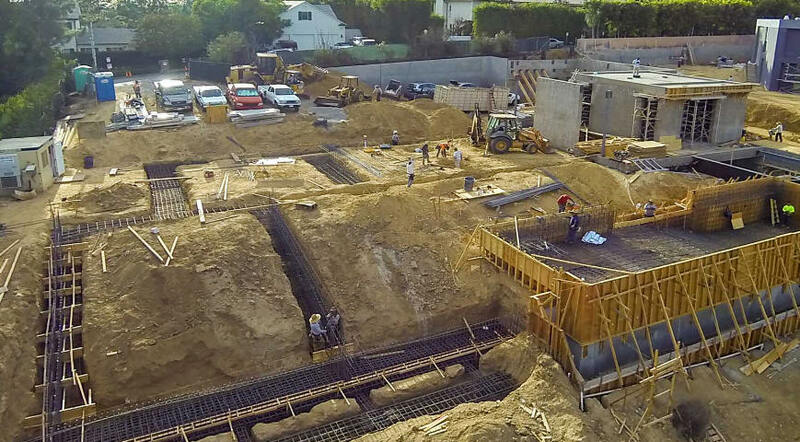 The complex became the center of gang activity and illegal drugs for Southern California. 1941 - The H. F. and Edith Lubsen House, 1262 Rubio Street, Altadena CA. 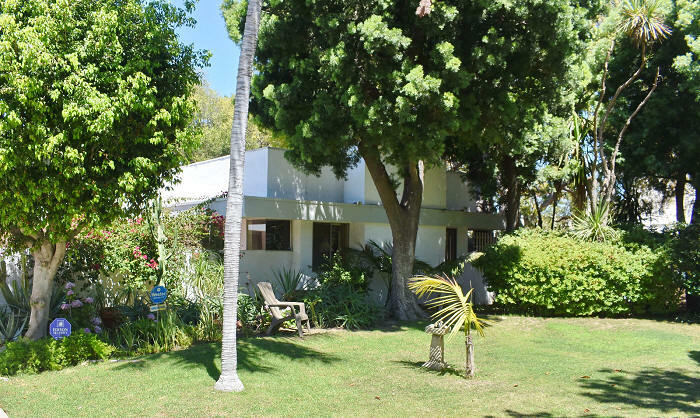 Sold in 1978 to Margaret Mostue. Bottom photo by Michael Locke. 1941 - The Rouben Mamoulian Remodel, 1419 North Beverly Drive, Beverly Hills CA. Unbuilt. 1941 - The Louis Robinson Residence #2, Comstock Avenue, Los Angeles CA. Unbuilt. 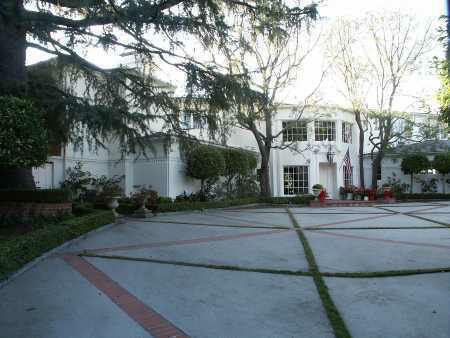 1941 - The Nelson Eddy House, 485 Halvern Drive, Brentwood Hills CA. Unbuilt. 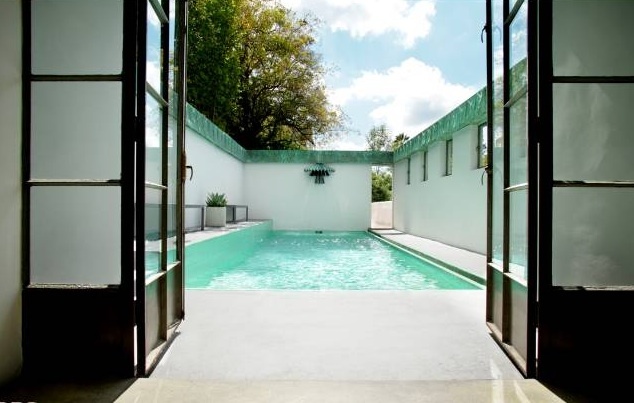 Often attributed to Wright, the house there was later designed by Marston and Maybury in 1939. Wright did another design for a "studio and terrace" for Eddy, unbuilt. 1941 - The Lionel and Bernice Lewis House and Garage Remodel, 527 North Crescent Drive, Beverly Hills CA. The original house was built in 1924. Sold to Samir Mikhail in 2000. Photo by Michael Locke. 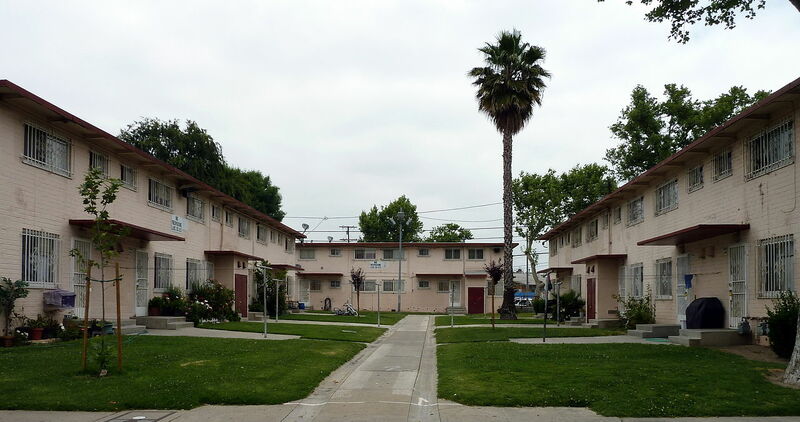 1942 - The Aliso Village Public Housing Project, 1400 Gabriel Garcia Marquez Street, Los Angeles CA. Wright was one of about eight architects involved including George Adams, Walter Davis, Ralph Flewelling, and Louis Eugene Wilson. 802 original units in 34 acres. Commissioned 1941. 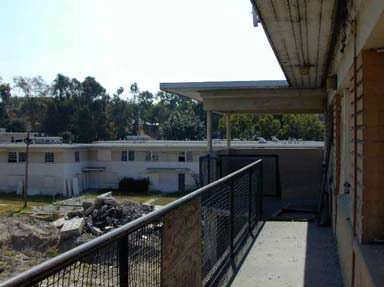 Destroyed in 1999 and replaced with a new 377-unit privately-managed public housing development called Pueblo del Sol. 1942 - Demountable Housing, Four-unit plan. Unbuilt. 1944 - The W. B. Tourtellotte House, Palos Verdes CA. Unbuilt. 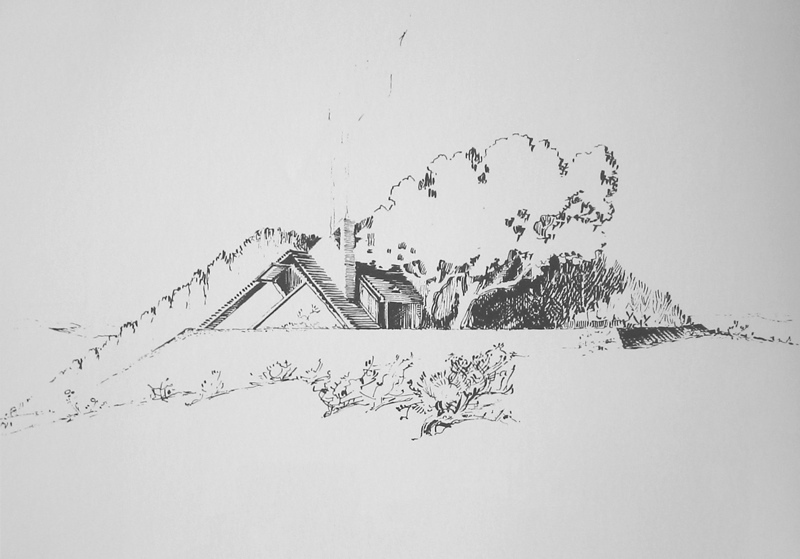 1944 - The Warren E. Smith House, Los Angeles CA Unbuilt. 1944 - The J. B. and Janet A. Schuyler II Additions and Alterations. 277 Club Drive, Palms CA. Unbuilt. 1944 - The Frank Jones House Remodel, 10503 Rountree Road, Los Angeles CA. Unbuilt. 1945 - The Pern Brower House, 2221 20th Street, Los Angeles CA. Unbuilt. 1945 - The Floyd Crosby House, North Hollywood CA. Unbuilt. 1945 - The Francisco Cardenas and Mary West House, aka 3-C Ranch, Oracle AZ. Unbuilt. 1945 - The L. B. Benjamin House Remodel, 1128 Calle Vista Drive, Beverly Hills CA. Unbuilt. 1945 - The David Loew Jr., House, 10357 Calvin Avenue, Los Angeles CA. Commissioned 1944. Unbuilt. 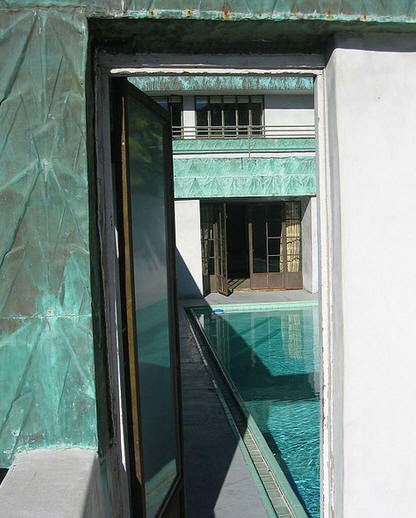 The house there as of 2014 is sometimes cited as Lloyd Wright but it is another architect. 1945 - The Harold Kaye Remodel #2, Comstock Avenue, Westwood CA. Unbuilt. 1946 - The Elias Antaky House, Los Angeles CA. Unbuilt. 1946 - The Mel Smith House and Garage, 3146 Haddington Drive, Los Angeles CA. Unbuilt. 1946 - The Frank and Edith Wyle Residential Development, Mulholland Drive, Los Angeles CA. Unbuilt. 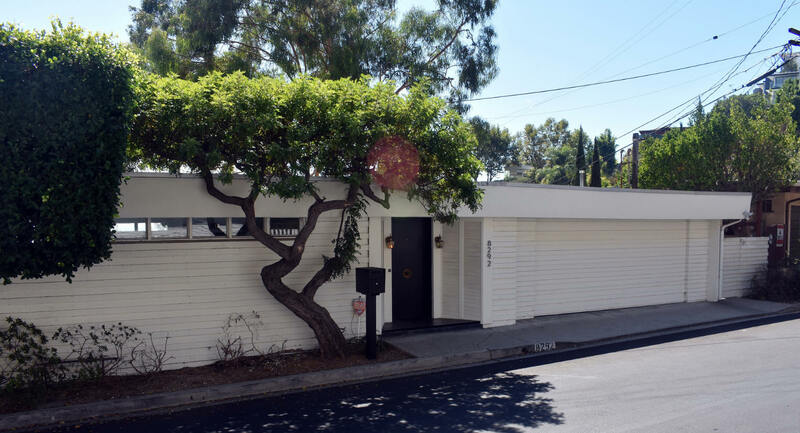 Around 1946 - The C. T. Kuttler Remodel, 866 North Doheny Drive, West Hollywood CA. Unbuilt. 1946 - The Mrs. Forrest Murray Remodel, Los Angeles CA. Unbuilt. 1946 - The Walter Smith House, no location. Unbuilt. 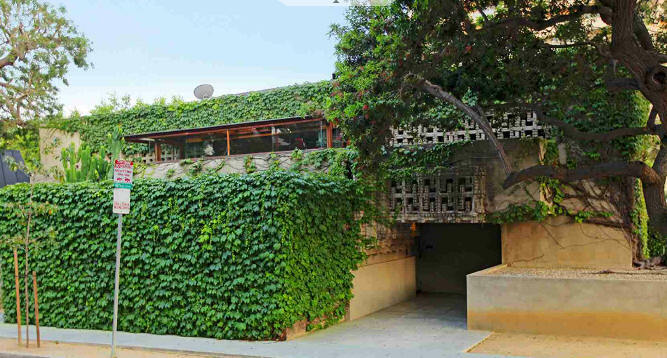 1946 - The Ivo Redlich House, Garage, and Landscaping, 602 North Arden Drive, Beverly Hills CA. House destroyed, possibly around 1988. Sold to Michael Dowd Trust in 1992. Sold to Steven and Robin Berlin in 1995. 1947 - The Kenneth S. and Catherine D. Baxter House, Woodside Hills, San Mateo CA. Unbuilt. The clients were actress Anne Baxter's parents. From an article in the "San Mateo Times", August 21, 1947: Mr. and Mrs. Kenneth Baxter of Burlingame CA today revealed that they had purchased a 2 1/2 acre homesite in a newly opened area of Woodside Hills, overlooking Menlo Country Club. They plan to build. 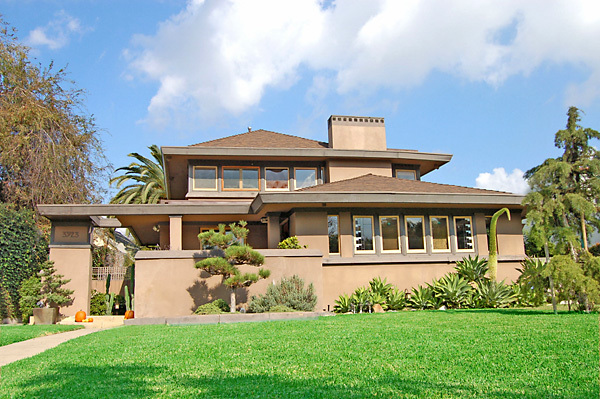 Plans for the home are being drawn by Mrs. Baxter's brother, famous architect Lloyd Wright, of Los Angeles. 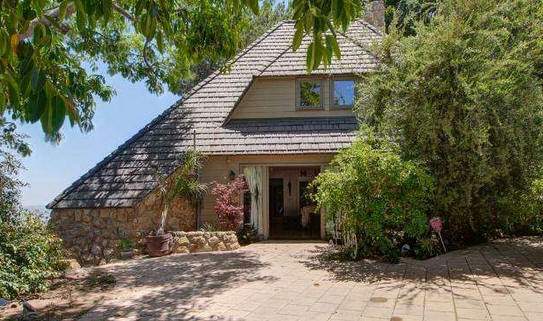 A feature of the home will be a unique guest cottage constructed especially for daughter, Anne, and her husband, John Hodiak, of Hollywood." 1947 - The Jane Tibbett House, Florida. Unbuilt. 1947 - The Henry Reitz Houses, 293 Beverly Glen and Charing Cross Road, Los Angeles CA. Unbuilt. 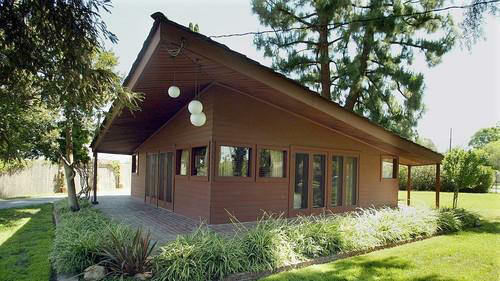 1947 - The W. E. Dean Carport, 20717 Malibu Road, Malibu CA. Unbuilt. 1947 - The Beatrice Wood Studio and House, Ojai CA. Unbuilt, due to spiraling projected costs. 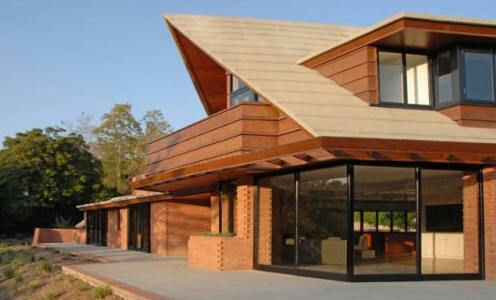 Wood then took the Wright design to an architect/designer in Oxnard CA who redid it for construction. 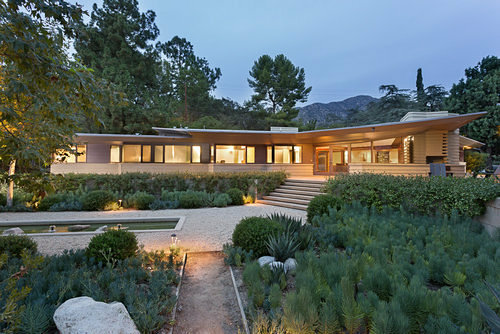 Wood had another Modernist home built in the 1970's by architect Paul Sterling Hoag. 1948 - The L. H. Powell House, 9101 St. Ives Drive, West Hollywood, CA. 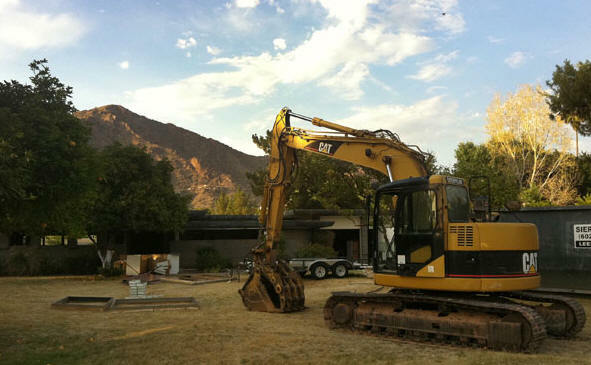 Sold in 2010 to Matt Khoury. Top photo by Michael Locke. 1948 - The Emmanuel Gainsburg House, 1210 Journey's End Drive, La Canada CA. Commissioned 1946. Wright also did the landscape design. Sold to the Wong Trust. Sold in 2001 to the Charles and Elisa Callow Trust. Restored by architect Richard Corsini. Sold in 2013 to the Celia Ann Shapiro and Antonio Moreira Joint Revocable Trust. Sold in 2016 to Eugene Park and Jee-Hyun (Sophie) Kim. 1948 - The Alma Norton Duffil House, West Hollywood or Malibu, CA. Unbuilt. 1949 - The Francis B. Blalock Apartments, Alhambra CA. Unbuilt. 1949 - The T. Leonard Mikules House, Palos Verdes CA. Unbuilt. Year Unknown - The Charles Forsch House, 942 La Jolla, Los Angeles CA. Presumed unbuilt. As of 2014, the address doesn't exist, but there is an apartment building at 940 and 946, 1927 and 1925 respectively. Both buildings appear to have been large homes as originally designed. Needs verification. 1949 - The J. Welton Addition, 859 North Wilcox, Los Angeles CA. Unbuilt. 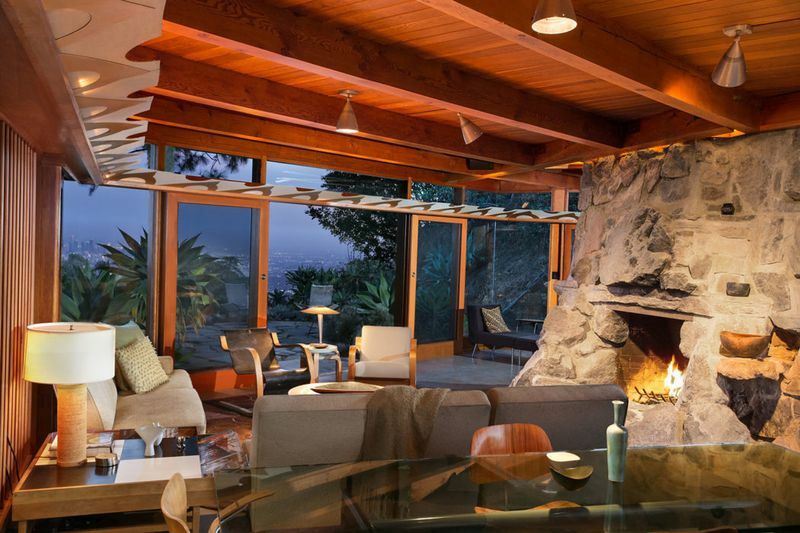 1949 - The David Harold Fink House, Mulholland Highway, Los Angeles CA. Unbuilt. 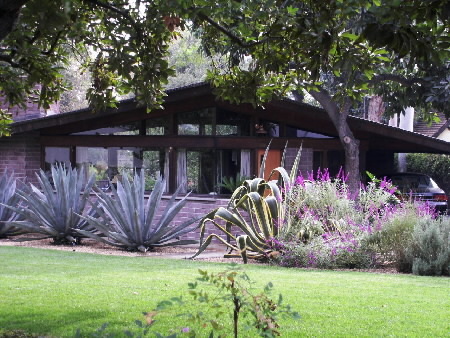 1949 - The Allan and Borgny Dorland House, 1370 Morada Place, Altadena CA. Sold in 2013 to Franklin Scott James and Miao Miao. 1949 - The Ralph Jester House, 20 Narcissa Drive, Palos Verdes CA. Wright's father Frank Lloyd Wright designed an unbuilt plan for Jester in the late 1930's. Deeded to the Lois Jester Trust. Gated community; no public access. Across the street from Wright's Wayfarers Chapel. 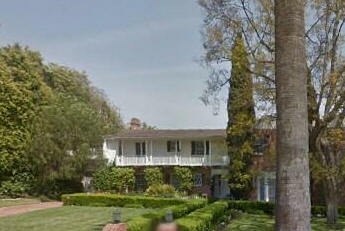 1949 - The Alfred Newman House, 14148 West Sunset Boulevard, Pacific Palisades CA. Renovations in 1951 and 1952. 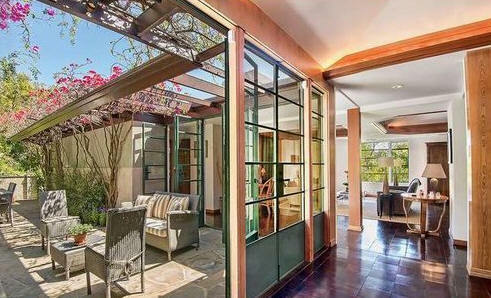 Sold in 2007 for the first time to a trust owned by Diane Hall, aka actress Diane Keaton who did a renovation. Sold in 2010 to Sgl Assets LLC, aka David Segel. 1950 - The Jozef Nabel House, 2323 La Mesa Drive, Santa Monica CA. Renovations by Wright in 1955 and 1970. As of 2014, still in the Nabel family. 1950 - The Arthur Erickson House, 5501 Londonderry Road, Edina MN. From the West Metro Star Tribune 6/3/2014...."The Arthur Erickson House was built in 1950 under the direction of architect Frank Lloyd Wright Jr. Arthur Erickson and his brother Alfred, who ran a petroleum business that became Holiday Stationstores, commissioned Wright to design two homes in Edina." Sold in 1993 to Brian and Linda Tell. 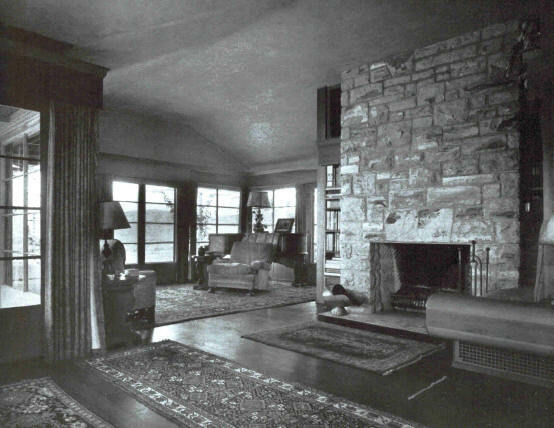 1950 - The Alfred W. Erickson House, 5408 Stauder Circle, Edina MN. Sold in 1998. Destroyed in 1998. 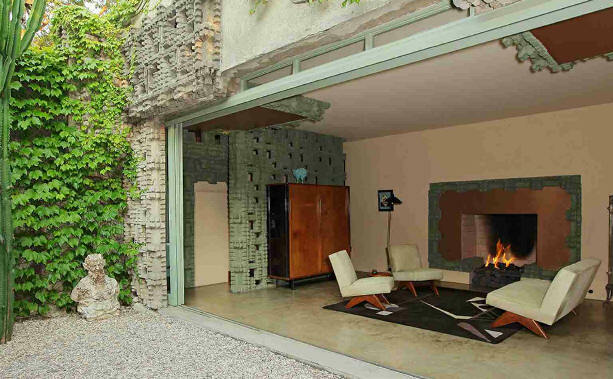 1950 - The Harold Shulman House, 211 Glenroy Place, Los Angeles CA. Altered in 1952. Photo by Michael Locke. 1950 - The Frank W. Jones House, 19818 Lorencita Drive, Covina CA. Unbuilt. 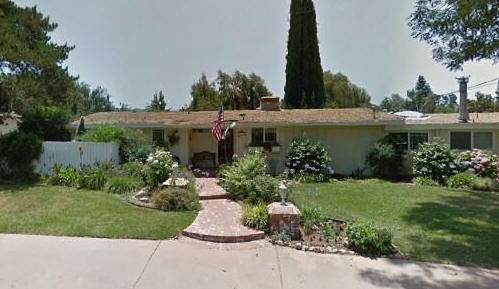 1951 - The Margaret J. Slater house, North Hiatt Street, La Habra CA. Unbuilt. 1952 - The Roy A. Kropp House, Chardon Farms, West Chardon Road, Grayslake IL. 1952 - The PJ Healy House, 565 Perugia Way, Los Angeles CA. 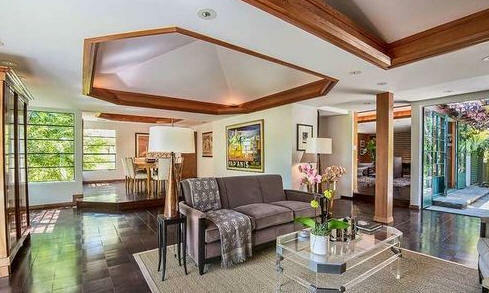 Located on the Bel Air Country Club Golf Course. 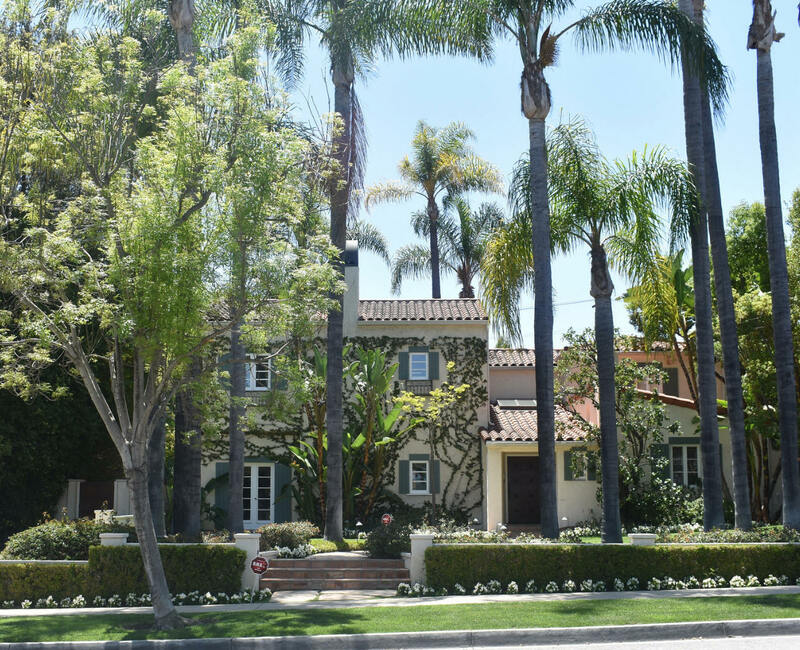 Sold to Ali Kahn and his wife Rita Hayworth. Elvis Presley rented the house starting in 1960. He had his only encounter with the Beatles there in 1965, and Presley was reportedly chilly to them. 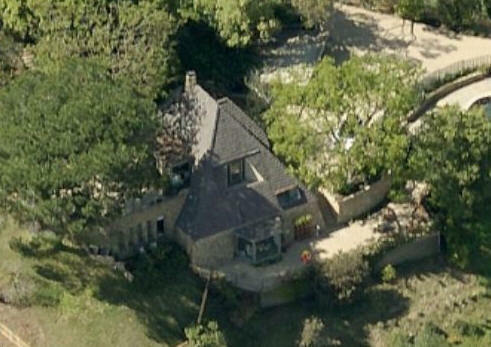 The house was used in the 1988 miniseries Elvis and Me. Sold in 1988. Destroyed and replaced in 1991 with a McMansion, bottom two photos. 1952 - The Charles Laughton Pool and Dressing Rooms Remodel, 1825 North Curson Avenue, Los Angeles CA. Original house was built in 1910. Sold to the Anthony Bonsignore Trust. Photo by Michael Locke. 1953 - The Gordon P. Wagner House, Portuguese Bend, Palos Verdes CA. Unbuilt. 1953 - The George M. Dell house, 840 Hanley Avenue, Los Angeles CA. Unbuilt. A house was later built at this address by the Dell family, but it was not by designed by Wright. 1953 - The Sadie Kanan Renovation, 240 Acari Drive, Los Angeles CA. Unbuilt. 1953 - The Russell Babcock House, Mission Cliff Drive, San Diego CA. Unbuilt. 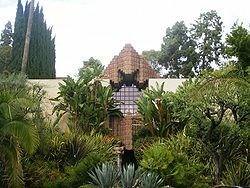 According to Eric Lloyd Wright, client Russell Babcock went to Frank Lloyd Wright in the early 1950s but ended up working with Lloyd Wright instead. That too did not work out, and Babcock hired a Mission Beach architect, Kendrick Bangs Kellogg, to design his dream house on Mission Bay in 1959, photos above. 1954 - The Frank Howard Remodel and Additions, 16475 Garvin Drive, Encino CA. Photo by Michael Locke. 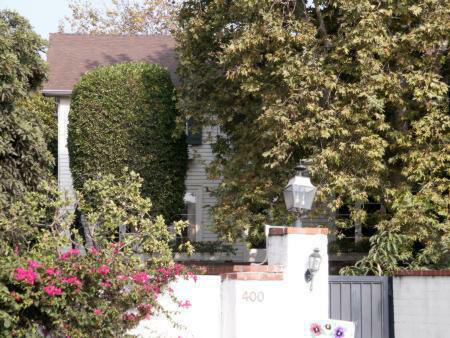 1954 - The G. Edward (Eddie) Hearn House, 10511 Selkirk Lane, Los Angeles CA. Commissioned 1952. Remodel and addition in 1954. Addition in 1957. Deeded to Gary Hearn. Sold to Stephen Klippenstein in 2005. Sold to Mark Podhajsky in 2009. 1954 - The R. V. Honeycutt House and Landscaping, 5221 Vista Hermosa Avenue, Long Beach CA. Deeded in 2012 to Timothy and Christopher Hoisington. Bottom photo by Michael Locke. 1955 - aka the Pent-o-Rama Residence for the Pent-o-Rama Building Company, Arbolado Road, Santa Barbara CA. Unbuilt. 1957 - The Louis Bartfield house, aka La Roca, Rolling Oaks Ranch, Ventura County CA. Unbuilt. 1956 - The Robert Childs House, Institute of Mentalphysics, Joshua Tree CA. Unbuilt. 1956 - aka the Pent-o-Rama house for the Pent-o-Rama Building Company, Angelo Drive, Holmby Hills CA. Unbuilt. 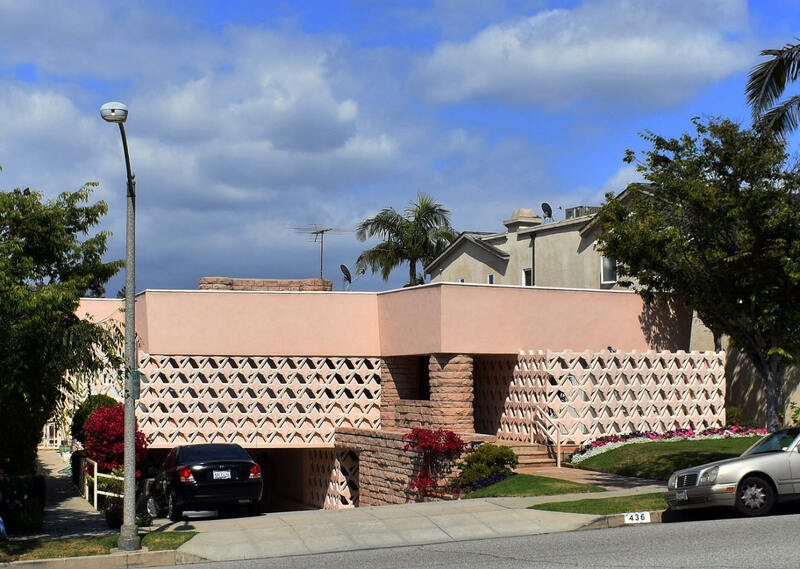 1956 - aka the Pent-o-Rama house for Armand and Lee Pedicini, Eureka Drive, Los Angeles CA. Unbuilt. 1957 - The Jacker House Remodel, 1265 Oakridge Avenue, Glendale CA. Unbuilt. House at this address was built in 1924. 1957 - The Rupert Pole and Anais Nin Beach House, Malibu CA. Unbuilt. Pole's mother was Lloyd Wright's second wife, and Pole's wife was Anais Nin. 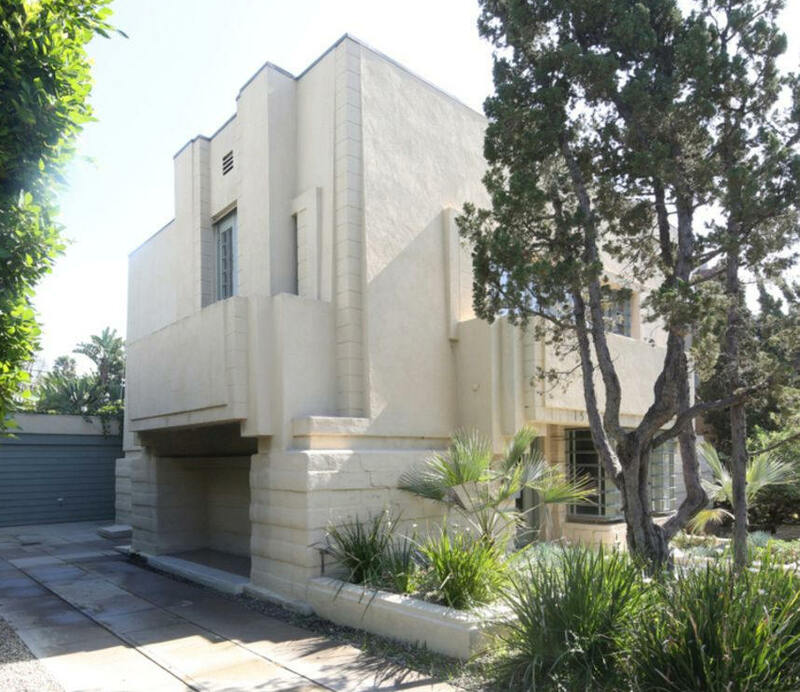 Eric Lloyd Wright, Pole's half brother and Lloyd's son, later designed a Silver Lake home for them. 1957 - The Louis and Annette Kaufman Remodel, 835 Westholme Avenue, Los Angeles CA. 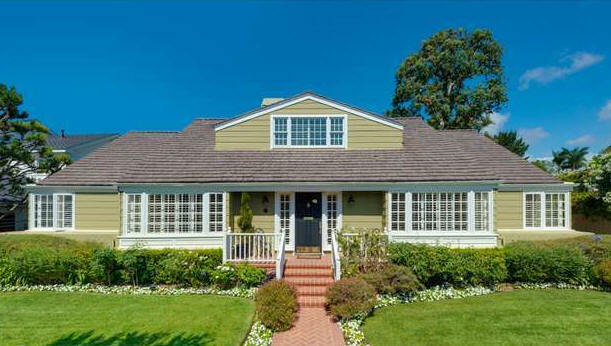 Originally built in 1935 and as of 2011 was still in the Kaufman family trust. Destroyed. 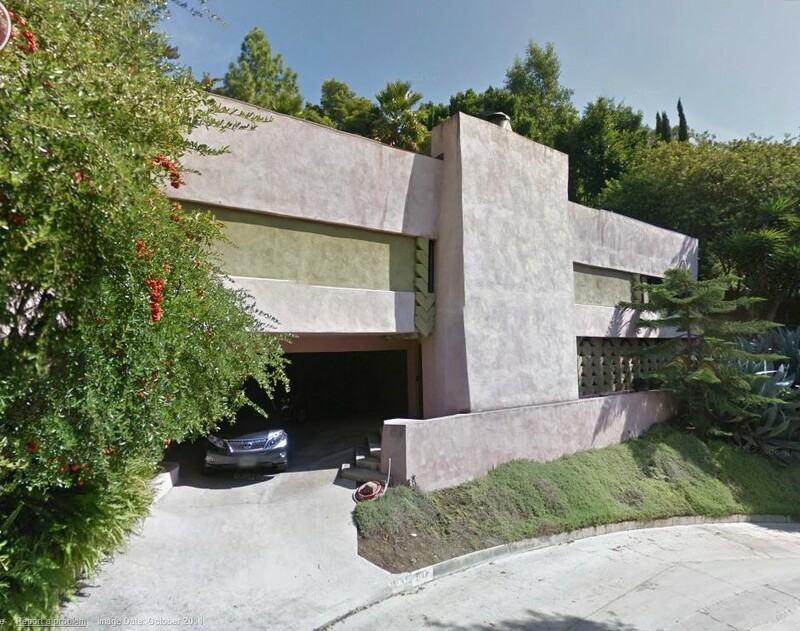 1957 - The Leonard and Edith Polster House, 1098 Hillcrest Road, Beverly Hills CA. 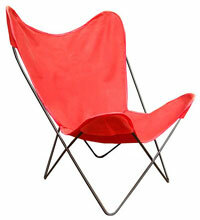 Sold to Grace and Eddie Ong, Grace Enterprises. Bottom photo by Michael Locke. 1957 - The Frank Howard Remodel, 16821 Oak View Drive, Encino CA. Original house was 1939. Sold to Marvin and Helen Adelberg in 2004. 1958 - The Veda Caroll House, North Beverly Drive, Los Angeles CA. Unbuilt. 1958 - The Lowell Dunham House, Palos Verdes CA. Unbuilt. 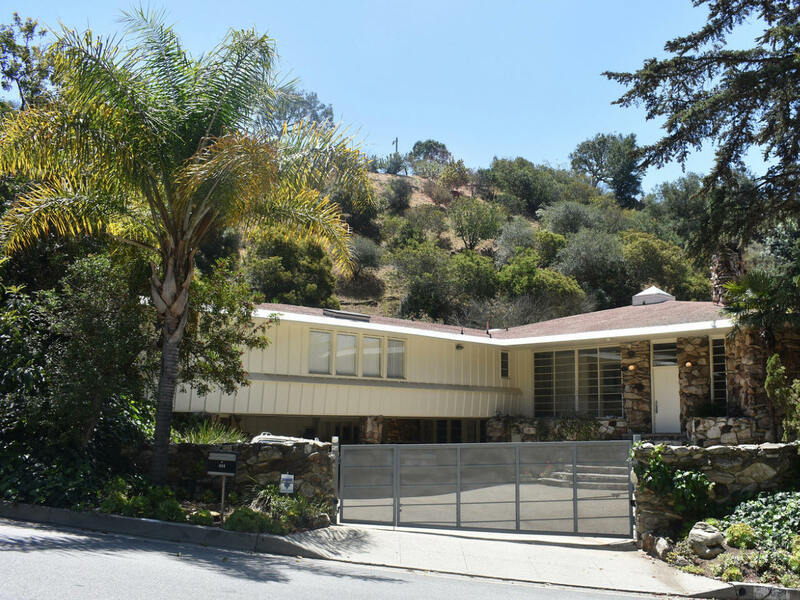 1958 - The Jack and Gloria Levand House, 1107 Wallace Ridge Road, Beverly Hills CA. Sold to Lorry Chen. Sold in 2001 to Don Choe. Rented 2010-2011. Sold in 2013 to Ryan Huang. 1959 - The John L. Mace House, 8292 Hollywood Boulevard, Los Angeles CA. Sold in 1997 to Bruce Cohen. Photo by Michael Locke. 1959 - The Daniel DeJonghe House, 9028 Crescent Drive, Los Angeles CA. Another 1949 home for him at the same location is listed in Wright's archives but reads "not designed." Sold in 1994 by the DeJonghe Trust to architect John B. Powell. Deeded to Powell in 2017 via 9028 Crescent Associates LLC. 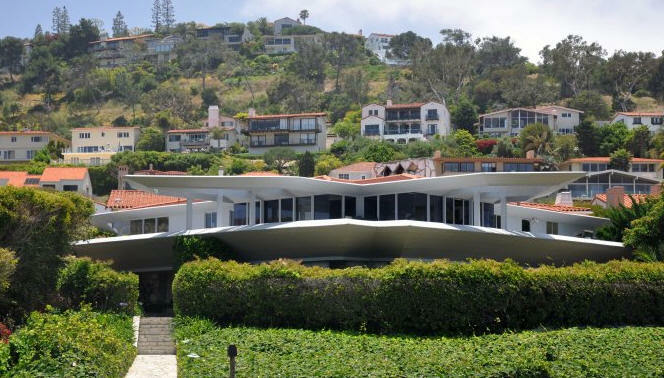 1959 - The Louis T. and Marriott Moore House, 504 Paseo del Mar, Palos Verdes Estates CA. Commissioned 1957. Built by Moore. 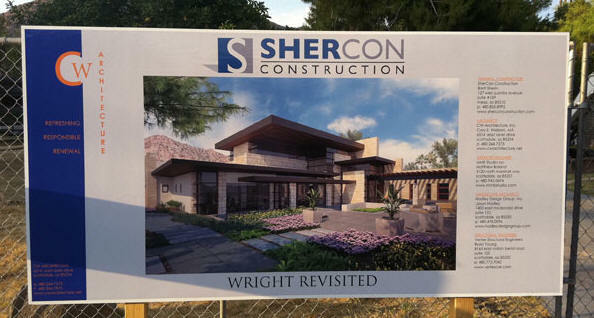 Wright's son, Eric Lloyd Wright, worked as onsite project manager. 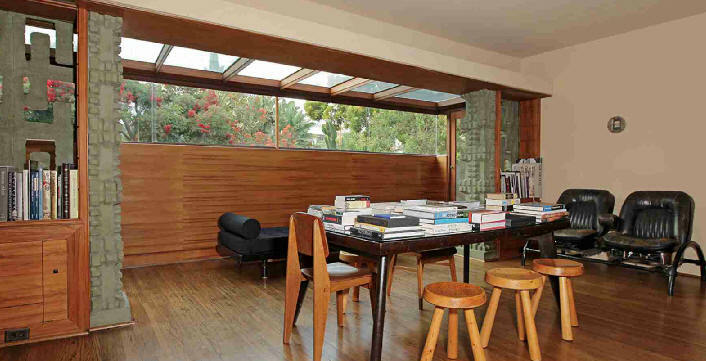 Moore specifically wanted a Modernist house. 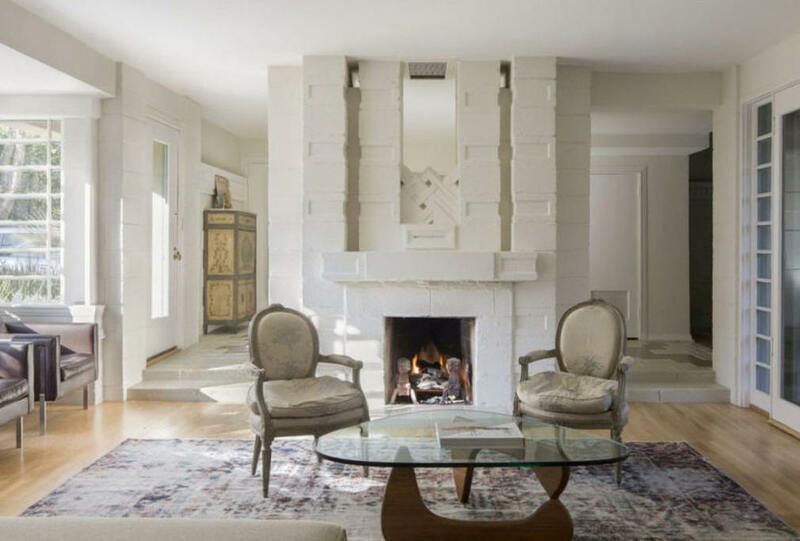 Deeded to Moore's heirs, who had it on the market for several years. 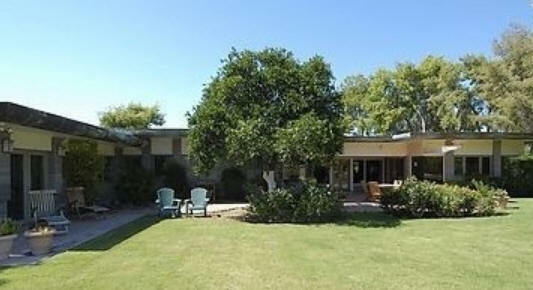 Sold in 2004 to Mark and Barbara Paullin. After a long battle with preservationists, it was destroyed in 2012, bottom photo. 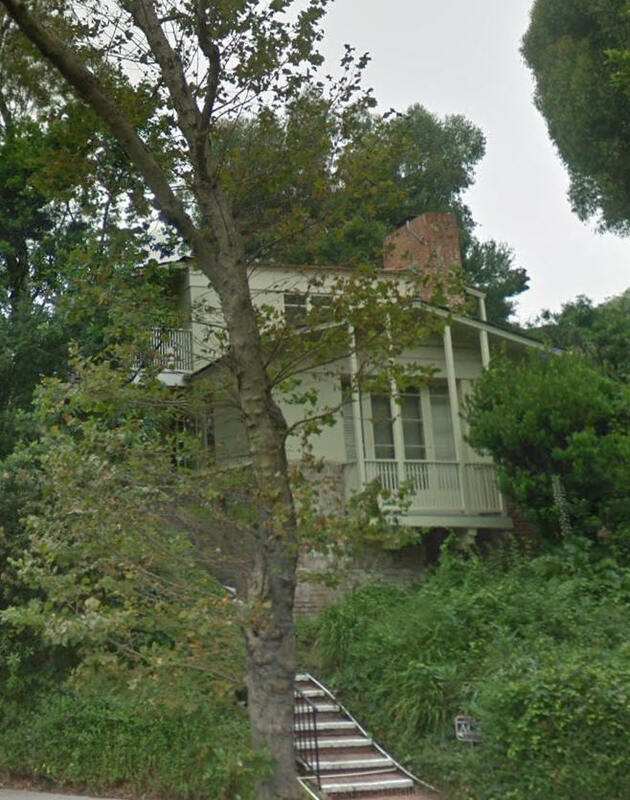 1959 - The John J. Lumbleau House, 22158 Pacific Coast Highway, Malibu CA. Unbuilt. 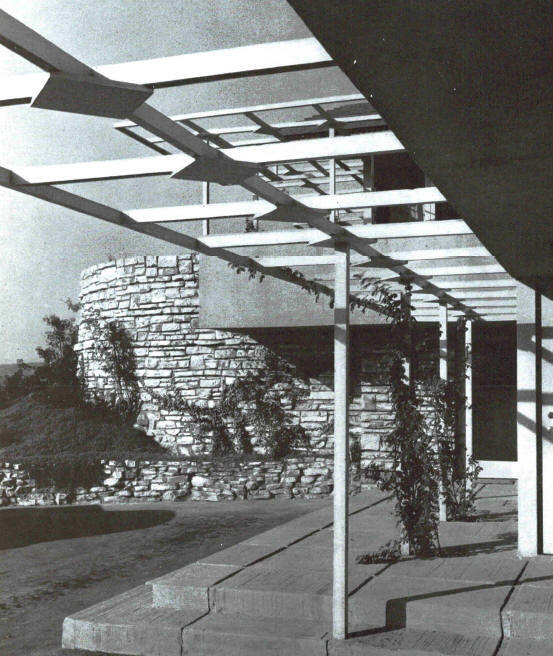 1960 - The Ronald Stein House, Granada Hills CA. Unbuilt. 1961 - The Charles Pihl House, aka Birdsong, 2410 Oakland Road, Minnetonka, MN. Built but not to Wright's full design. For sale in 2014. Website. 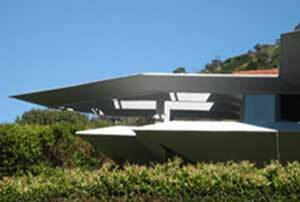 1961 - The Jascha Heifetz Beach House, Malibu Road, Malibu CA. Unbuilt. 1961 - The Louis M. Seeburger Remodel, 4661 Vanalden Avenue, Tarzana CA. Unbuilt. 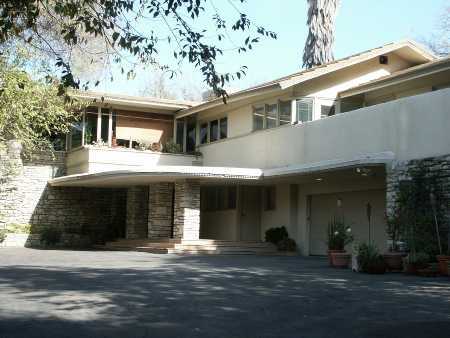 1961 - The Jacon and Sophia Karasik Residence, 436 South Spalding Drive, Beverly Hills CA. Commissioned 1960. Altered 1978. 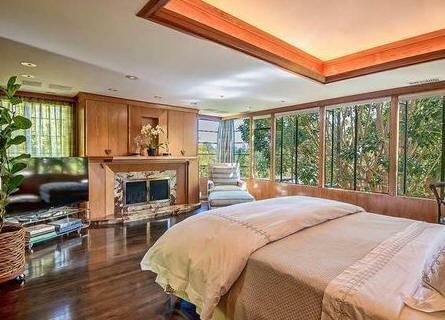 The living room juts over the pool in the back like the bridge of a ship. Photo by Michael Locke. Deeded to the Karasik Trust. 1962 - The Robert Hare Remodel, 642 Perugia Way, Los Angeles CA. Original date of the house is unknown. Hare opened the Insomniac Cafe in Hermosa Beach CA in the late 1950's. It was a "beat" performers venue and included appearances by Allen Ginsburg and others. Linda Ronstadt reportedly was a waitress and an occasional singer. Sold in 2002 to Eugene P. Leoni and Terry J. Moore. Sold in 2004 to David Murdock as a trust. Sold to Castle Cooke Bellagio Properties. Sold to Perugia LLC in 2012. Destroyed. 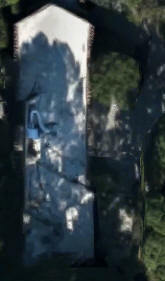 As of 2014, Quinn Architects of London has a 13,000sf Modernist spec house under construction on the site, photo above. 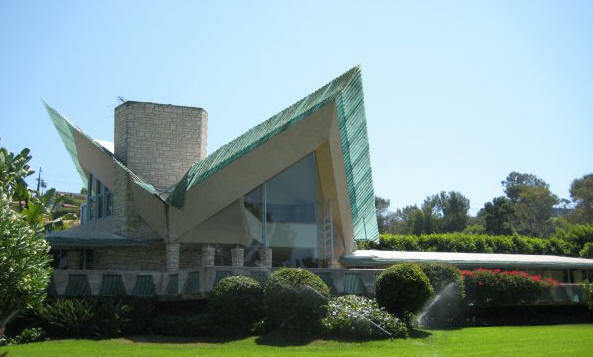 1963 - The John P. Bowler House, aka Bird of Paradise, 3456 Via Campesina, Palos Verdes Estates CA. Sold to Edward and Renee Adams. 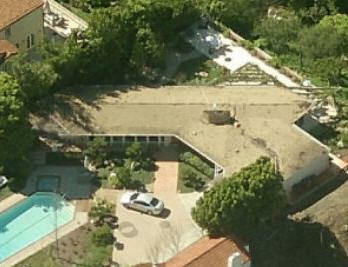 1963 - The Beverly Johnson House, 7017 Senalda Drive, Los Angeles CA. Sold in 2003 to the David Lynch Trust. Bottom photo by Michael Locke. 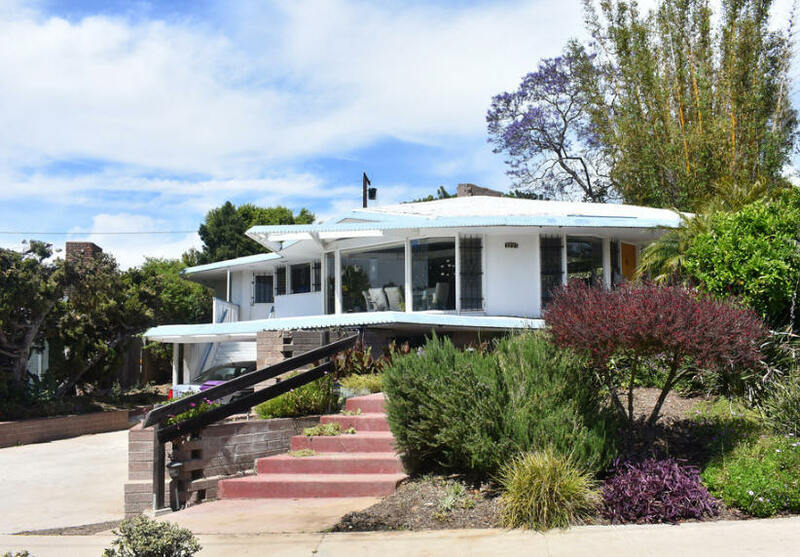 1963 - The Louis Samuel House, Glendower Avenue, Los Angeles CA. Unbuilt. 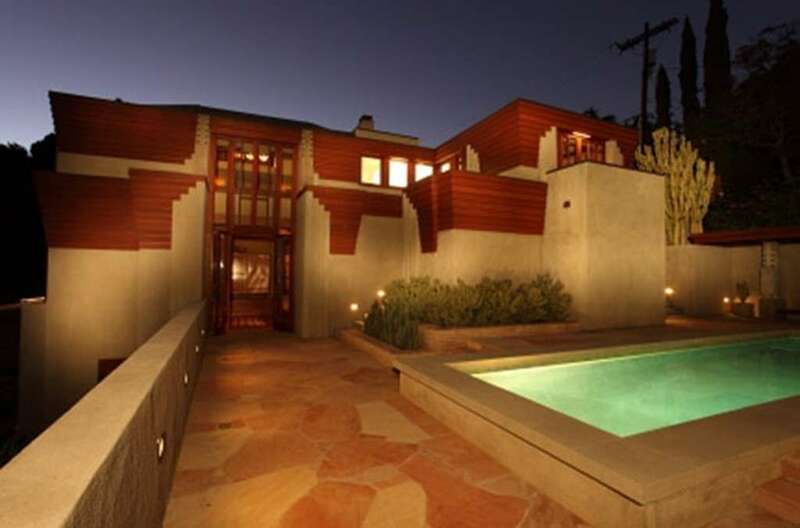 Eric Lloyd Wright was the project architect. 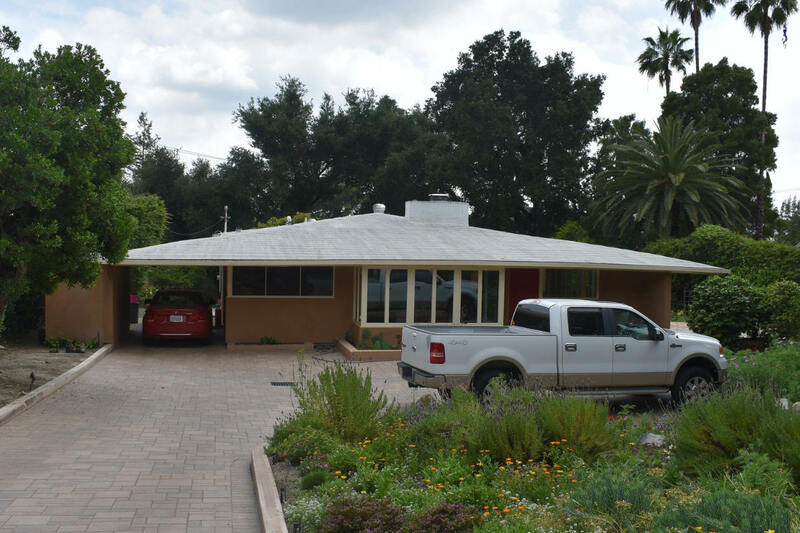 1963 - The Leonard A. Harris House, Timken Road, Orange County CA. Unbuilt. 1963 - The John Pfeiffer and William Hulet House, Granada Road, Coral Gables FL. Unbuilt. 1964 - The Terrace Park Apartments for Lincoln Fidelity Corporation, 10842 Magnolia Avenue, Stanton, CA. Unbuilt. 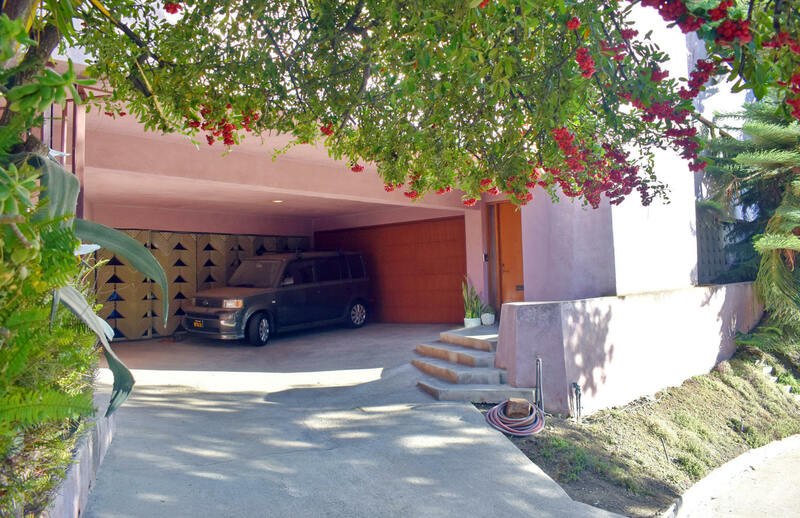 1968 - The John and Delores Lombardi House, 804 Gatos Place, Palos Verdes Estates CA. Commissioned 1965. Altered in 1979. Sold to Matt and Christine Hill. 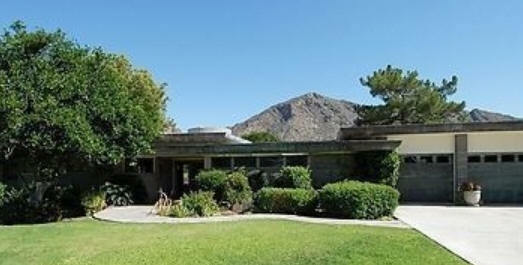 1968 - The David Lloyd Wright, Jr. House, 5226 East Exeter Boulevard, Phoenix AZ. Sold to Karen and Scott Robinson. 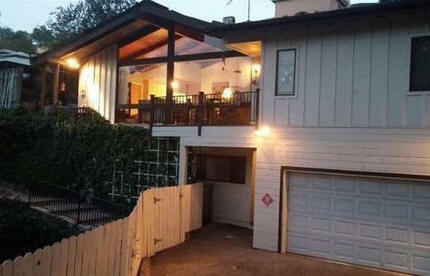 Sold in 2009 to Corey and Marissa Hochman. Sold in 2011 to Zachary Rawling. Rawling destroyed this Lloyd Wright house to build a "Wright revisited" (as in Frank, not Lloyd), designed by CW Architecture, bottom photo. 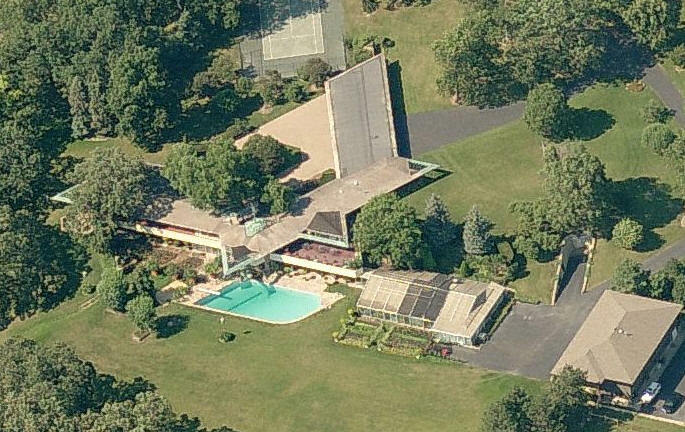 In 2012, Rawling also bought the 1952 FLW house built for David Lloyd Wright Sr. at 5212 Exeter Boulevard. 1965 - The George Headley Garage and Stables Remodel, aka the Headley-Handley House, 3003 Runyon Canyon Road, Los Angeles CA. Entrance at 2000 North Fuller Avenue. A&P heir George Huntington Hartford II purchased a mansion on the property in 1942 which later crumbled into ruins. He sold a parcel up the hill to Headley who commissioned Wright to design a house on the ridge - but got only as far as building a stable and garage before running out of cash. 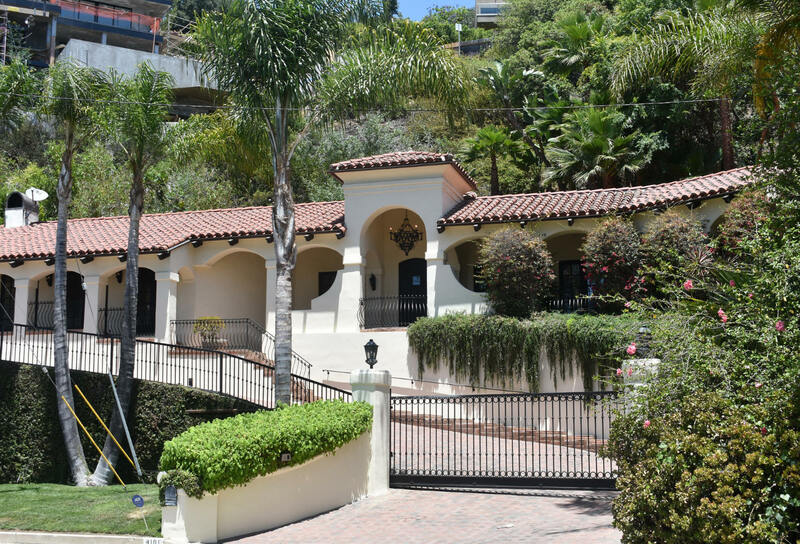 In the late 1950's, actor Errol Flynn rented here, throwing many notorious parties. Deeded to son Alan Handley who lived there for 35 years. In 1965, Alan Handley commissioned Wright for a remodel which was unbuilt. Deeded to his son, Paul Handley. Sold to Robert W. Lyons, who tried unsuccessfully to build another house there in 1995. Sold in 2006 to Kodiak Holdings. Sold in 2010 to Sophie Stenbeck. Sold in 2014 to Manuel and Alicia Valenda. 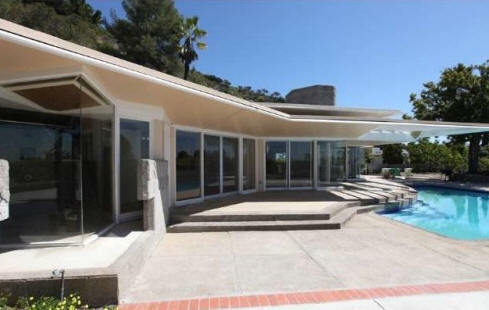 1968 - The James and Jane C. Welton Remodel, 970 Bel Air Road, Los Angeles CA. Sold to Ber and Raquel Oberfeld in 2007. Deeded in 2013 to 970 Bel Air Road LLC, controlled by the Oberfelds. As of 2014, the house was destroyed and the land sold in 2018. 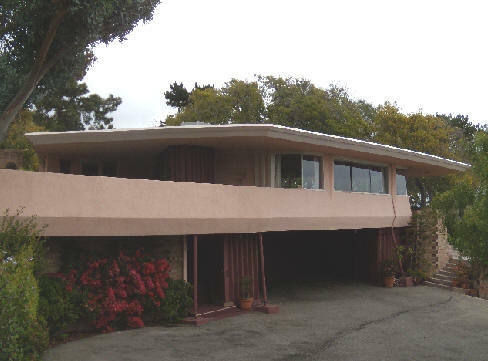 1968 - The S. F. Moorehead Pavilion and Loggia, 7 Maverick Lane, Rolling Hills CA. Unbuilt. 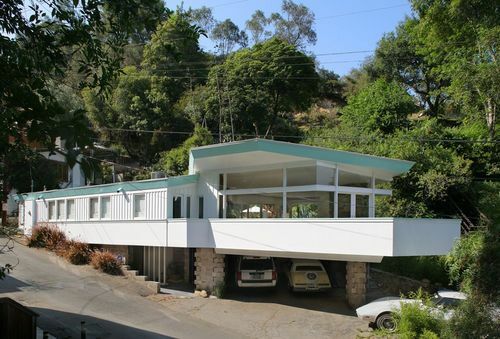 1968 - The Louis LaRue House, 35201 Mulholland Highway, Los Angeles CA. 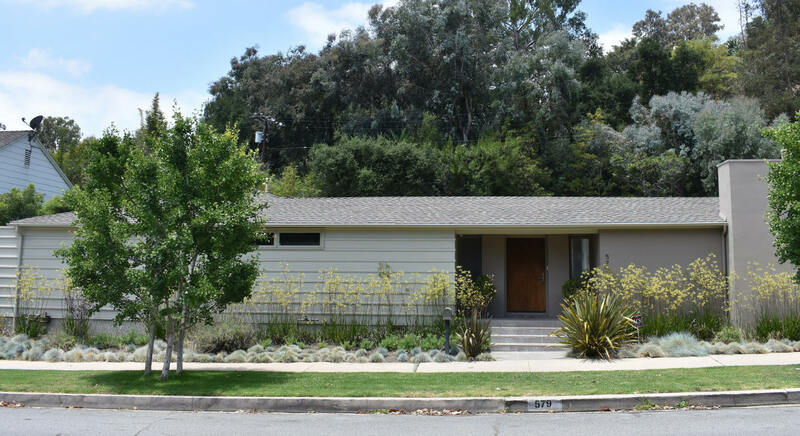 The property is listed as a single family residence, built in 1963, but shows in 2014 as only a 462 sf empty parcel. Deeded in 1996 from the Marguerite LaRue estate to Jack and Christine Pritchett. Needs verification. 1969 - The Rev. 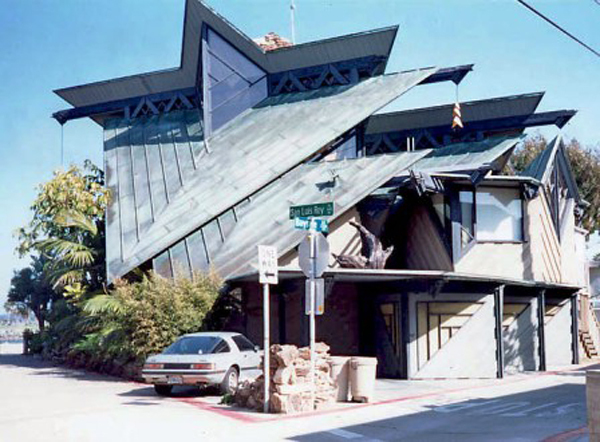 Robert Alexander House, Thousand Oaks CA. Unbuilt. 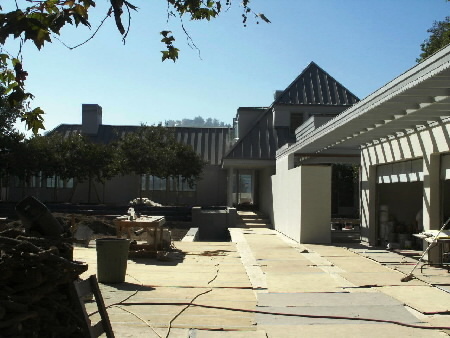 1971 - The Leonard Bellenson Renovation, 410 Capri Drive, Simi Valley CA. Original house designed in 1958. 1973 - The George Tomer House, 16321 Kinzie Street, Sepulveda CA. Unbuilt. 1974 - The Burns Henry Jr. house, Glen Oak Hills, Rancho California CA. Unbuilt. 1975 - The Max Lair House and Solar Farms Subdivision, Granite Mountain, Apple Valley CA. Unbuilt. In March 1974, Lair was building a hydroponic farm between Apple Valley and Lucerne Valley CA with sun-powered heat and wind-generated electricity. Unfortunately in December 1975 Lair was charged with grand theft and conspiracy in connection with the creation of false trust deeds. He was ultimately acquitted on seven counts of grand theft but convicted on one count of violating the state subdivided-lands law. 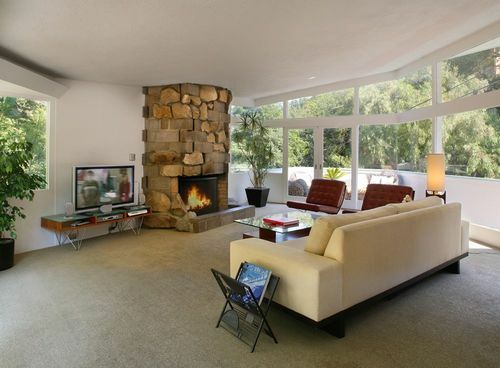 1978 - The W. E. Crosby Remodel, 53 Empty Saddle Lane, Rolling Hills Estates CA. Unbuilt. 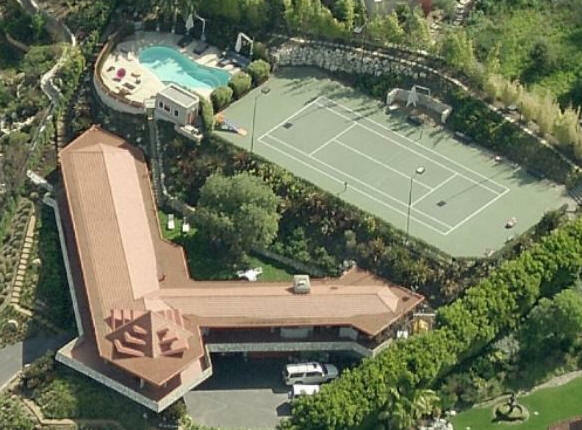 1980 - The David Newman House, 6353 Busch Drive, Malibu CA. Commissioned 1977. Still owned as of 2013 by the Newmans. Sources include: Wikipedia, LA Conservancy.